제1도는 본 발명의 디지탈 변조 방법의 제 1 실시예에 따른 디지탈 변조를 실행하는 디지탈 변조 장치를 보여주는 블록 다이어그램. First turning block diagram showing a digital modulation apparatus for executing a digital modulation according to the first embodiment of the digital modulation method of the present invention. 제2도는 디코딩 회로의 한 실시예를 보여주는 블록 다이어그램. A second turning block diagram showing one embodiment of a decoding circuit. 제3a도는 재생된 신호의 캐리어 대 잡음비를 111 주는 그래프. 3a the graph 111 that the carrier-to-noise ratio of the reproduced signal leads. 제3b도는 본 발명의 제 1 실시예의 전력 스펙트럼을 보여주는 그래프. 3b to turn the graph showing the power spectrum of the first embodiment of the present invention. 제3c도는 스크램블된 NRZ의 전력 스펙트럼을 보여주는 그래프. 3c shows the turning a power spectrum of the scrambled NRZ graph. 0인 14-비트 디지탈 변조 코드수를 보여주는 도면. 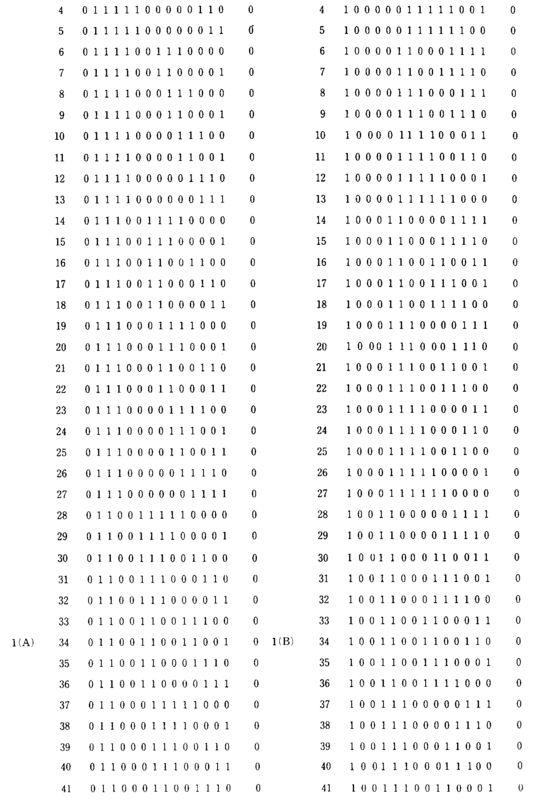 0. view showing the number of 14-bit digital modulation code. 0인 14-비트 디지탈 변조 코드의 수를 보여주는 도면. 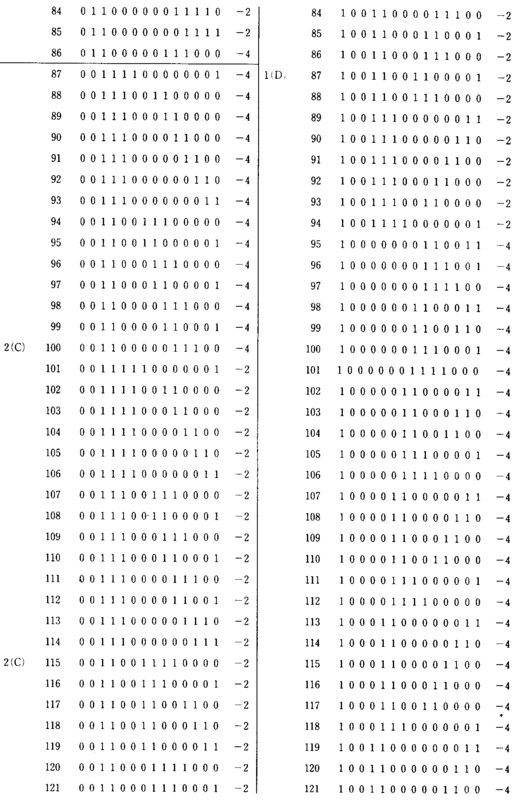 0 diagram showing the number of 14-bit digital modulation code. 제6도는 본 발명의 디지탈 변조 방법의 제 2 실예에 따른 디지탈 변조를 실행하는 디지탈 변조 장치를 보여주는 블록 다이어그램. The sixth turning block diagram showing a digital modulation apparatus for executing a digital modulation according to the second silye of the digital modulation method of the present invention. 제7도는 제 2 실시예에 따른 디지탈 변조를 실행하는 디지탈 변조 장치의 변조 절차를 보여주는 흐름도. Seventh turn flowchart illustrating a modulation process in the digital modulation apparatus for executing a digital modulation according to the second embodiment. 본 발명은 8비트 디지탈 데이타를 14비트 디지탈 변조 코드로 변환하는 디지탈 변조 방법에 관한 것이다. The present invention relates to a digital modulation method for converting 8-bit digital data into 14-bit digital modulation code. 디지탈 데이타를 자기테이프에 기록하거나 자기테이프상에 기록된 디지탈 데이타를 재생하는 종래의 장치는 디지탈 데이타를 기록 또는 재생하기 위해 로터리 변환기를 이용한다. The conventional apparatus for recording digital data on a magnetic tape or reproducing the digital data recorded on the magnetic tape is used in a rotary converter to record or reproduce digital data. 기록은 디지탈 데이타를 로터리 변환기를 통해 로터리 헤드에 제공하므로써 실행되고 로터리 변환기를 통해 로터리 자기 헤드로 디지탈 신호를 판독하므로써 실행된다. Recording is carried out by running by providing a rotary head digital data through the rotary transducer is read out a digital signal with the rotary magnetic head through a rotary transformer. 결과적으로, 재생된 신호가 DC(직류) 성분을 포함한다면, 디지탈 데이타는 올바르게 재생될 수 없다. As a result, if the reproduced signal includes a DC (direct current) component, the digital data can not be displayed correctly. 이러한 이유때문에, 디지탈 데이타는 DC 없는 디지탈 변조 시스템을 이용해 기록해야만 한다. For this reason, the digital data must be recorded using a digital modulation system without DC. 종래의 DC 없는 디지탈 변조 시스템중에는 다음과 같은 시스템이 널리 알려져 있다. Among the conventional DC free digital modulation systems, the following system is well known as. DR(밀도비)이 0.8인 8-10 변조 시스템은 일본 특허출원 공개 제56-19506호에 기술되어 있다. DR (density ratio) of 0.8 in 8-10 modulation system is described in Japanese Patent Application Laid-Open No. 56-19506 call. DR이 1인 변조 시스템으로서는 M 2 변조 시스템이 알려져 있다. As the modulation system, the DR 1 is known M 2 modulation system. DR이 1.14인 변조 시스템으로서는 일본 특허출원 공개 제61-196469호에 기술되어 있는 8-14 변조 시스템이 알려져 있다. As the DR is 1.14 in a modulation system is known 8-14 modulation system described in Japanese Patent Application Publication No. 61-196469. 이 시스템은 각각의 8비트 디지탈 데이타에 대해 14-비트 디지탈 변조 코드를 4개 까지 제공한다. This system provides up to four 14-bit digital modulation codes for each 8-bit digital data. 14비트 변조 코드의 CDS(코드 워드 디지탈 합)이 0일때, 코드는 그것의 반전 패턴과 함께 쌍을 이룬다. 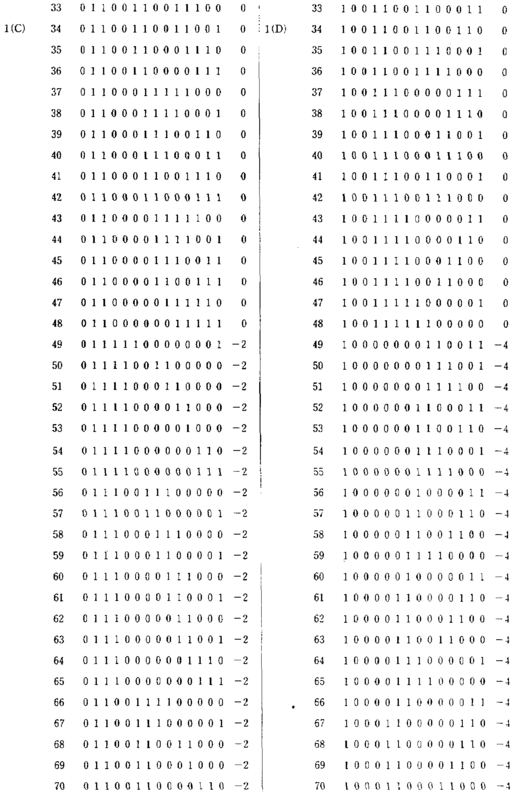 CDS (code word digital sum) of the 14-bit modulation code is zero, the code is paired with its inverted pattern. 14비트 디지탈 변조 코드의 CDS가 0이 아니면, 코드는 다음의 3코드와 그룹으로 된다 : CDS의 절대값 및 부호가 상기 코드의 것과 다른 14비트 변조 코드 ; 14-bit digital modulation code, CDS is not 0, the code is grouped with the following three codes: the absolute value and the sign of the CDS of the code as a 14-bit modulation code; 및 각각의 코드의 반전 패턴. And the reversal patterns of the respective codes. 여기서 CDS는 변조 코드의 제 1 비트에서 마지막 비트까지 계산된 DSV로 정의하며, DSV(디지탈 합 값)은 일련의 디지탈 변조 코드에 있는 각각의 비트 “0”에 대해 -1을 더하므로써 그리고 일련의 디지탈 변조코드에 있는 각각의 비트 “1”에 대해 1을 더하므로써 얻어진 전체합이다. 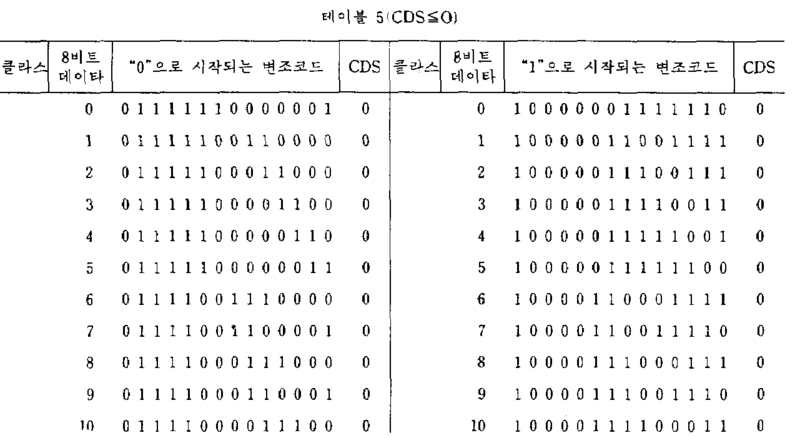 Here, CDS is defined as By, and the calculated up to the last bit in the first bit DSV of the modulation code, DSV (digital sum value) is -1, more for each bit "0" in a series of digital modulation codes and a set of by adding 1 for respective bits "1" in the digital modulation code, the total sum thus obtained. 반전 패턴은 한 코드에 있는 각각의 비트를 반전시키므로써 얻어진 패턴이다 : 비트 “1”은 “0”으로 반전되는 한편 비트 “0”은 “1”로 반전된다. Reverse pattern is a reverse pattern obtained written because each bit in a code: bit "1" is inverted to "0", while the bit "0" is inverted to "1". 상술된 종래의 변조 시스템들은 다음과 같은 문제점을 갖고 있다. Conventional modulation system described above may have the following problems. 8-10 변조 시스템은 그것의 낮은 0.8 DR 때문에 고밀도 기록에는 적절치 못하다. 8-10 modulation system mothada fit the bill because of its low density recording 0.8 DR.
M 2 변조 시스템은 그것의 1인 DR 때문에 고밀도 기록에 한정된다. M 2 modulation system is limited to high-density recording because of its DR person. 8-14 변조 시스템은 각각의 8비트 코드에 대해 4변조 코드까지 갖고 있고, 디지탈 변조 코드의 CDS의 절대값은 6까지 허용된다. 8-14 modulation system may have up to 4 modulation codes for each 8-bit code, the absolute value of CDS of the digital modulation codes are allowed up to 6. 또한 코드 스트림으로된 각각의 14비트 변조 코드의 끝에서 DSV는 ±4까지 허용되고, 일련의 14비트 디지탈 변조 코드에 있는 각 비트에서 DSV는 ±9까지 허용된다. In addition, DSV at the end of each 14-bit modulation code, the code stream is allowed up to ± 4, DSV at each bit in a series of 14-bit digital modulation codes is allowed up to ± 9. 결과적으로, 변조코드의 DC 성분을 짧은 시간에 제거하는 것이 어렵고, 그 때문에 저주파수 성분이 로터리 변환기를 갖춘 기록/재생 시스템에서 적당히 통과되어야만 한다. As a result, it is difficult to remove the DC component of the modulation codes in a short time, so must be adequately passed in a recording / reproducing system to low-frequency components with a rotary transducer. 8-14 변조 시스템은 다른 문제점이 더 있다. 8-14 modulation system is still another problem. 일반적으로 말하면 자기 테이프의 자화 깊이는 자화된 파장의 약 1/4이다. Generally speaking, magnetizing depth on magnetic tape is about 1/4 of the magnetized wavelength. 기록 신호들이 테이프상에 재기록(over-writing) 될때, 다음과 같은 문제점이 발생한다 : 가장 짧게 자기화된 파장의 4배 이상인 가장 길게 기록된 파장상에 가장 짧게 자기화된 파장의 새로운 신호를 기록하면 기록 매체의 가장 깊은 부분에 남아 있는 잔재가 지워지지 않는 결과가 나타난다. Recording signals when rewriting (over-writing) on ​​the tape, and the following problems occur: the shorter the shortest on the longest recorded more than four times that of the magnetized wavelength wavelength recording a new signal of the magnetized wavelength When it receives the results that erased the remnants that remain in the deepest part of the recording medium. 이러한 지워져야한 자재(residue)는 새로운 신호의 재생동안 나타나고, 그 때문에 재기록이 실제로 어렵게 된다. This is clear dirty material (residue) appears during the reproduction of the new signal, and because the rewriting is actually difficult. 그래서, 8-14 변조 시스템은 8-14 변조 코드 트레인내의 연속한 동일 비트(“0” 또는 “1”)수가 2-9이기 때문에 재 기록을 실행할때 지워져야할 잔재에 의해 발생되는 문제점에 봉착하게 된다. Thus, the 8-14 modulation system is faced with problems caused by the residues to be deleted when executing the re-recorded because the consecutive identical bits ( "0" or "1") in a 8-14 modulation code train number 2-9 It is. 이하의 설명에서 “연속한 동일 비트”란 용어는 2 이상의 연속한 동일 비트를 의미하는데, 예컨대, “000” 또는 “11”을 들수 있다. "In the same bits of consecutive" term in the description which follows, it indicates the same bit of consecutive two or more of, for example, deulsu "000" or "11". 그러므로, 본 발명의 목적은 상기 문제점들을 해소할 수 있는 디지탈 변조 시스템을 제공하는 것이다. It is therefore an object of the invention to provide a digital modulation system that can solve the above problems. 본 발명에 따른 이러한 변조 시스템은 고밀도로 기록을 할 수 있고, DC 성분을 아주 효과적으로 줄일 수 있으며, 애지무스 기록(azimuth recording) 및 재기록도 실행할 수 있다. The modulation system according to the present invention may be written at a high density, it is possible to reduce the DC component is very effective, it can also run who asked mousse record (azimuth recording), and rewritable. 본 발명의 제 1 양상에 따르면, 8비트 디지탈 데이타를 14비트 디지탈 변조 코드로 변환하는 디지탈 변조 방법은, 각각의 8-비트 디지탈 데이타를, (a) 2 14 14-비트 디지탈 코드중에서, 연속한 동일 비트의 수가 제1의 6비트에서는 5 또는 그 이하이고 제 2 비트에서 제13비트까지에서는 2-7이고 마지막 7비트에서는 6 또는 그 이하이며, CDS(코드 워드 디지탈 합)의 절대값이 4 이하인 디지탈 코드를 선택하고, 이러한 선택 절차를 반복하는 절차, (b) 절차(a)에서 선택된 14비트 디지탈 코드중에서, 제 1 비트가 “0”이고 CDS 값이 0인 디지탈 코드를 선택하고, 2개의 디지탈 코드를 1그룹으로 만들기 위해 상기 선택된 14비트 디지탈 코드와 그것의 반전 코드를 쌍으로 하고, 또는 절차(a)에서 선택된 14비트 디지탈 코드중에서, 제 1 비트가 “1”이고 CDS의 값이 +2 또는 +4인 According to a first aspect of the invention, a digital modulation method for converting 8-bit digital data into 14-bit digital modulation code is, for each 8-bit digital data, (a) 2 14 from the 14-bit digital codes, continuous in the number of the same bits of 6 bits of the first 5 or less and the second bit to the 13th bit 2-7 and bit 7 is the last in the 6 or less, the absolute value of CDS (code word digital sum) 4 less process of selecting a digital code, and repeating this selecting procedure, (b) procedure in 14-bit digital codes selected from (a), the first bit is selected for the digital code "0" and the CDS value is zero, and 2 from one digital to make the code as the first group and the selected 14-bit digital code and its inverted code in pairs, or steps (a) 14-bit digital codes selected at the first bit is "1" and the value of CDS the +2 or +4 디지탈 코드를 선택하고, 선택된 14비트 디지탈 코드와 그것의 반전 코드를 결합하고, 또한 4 디지탈 코드를 1그룹으로 만들기 위해 상기 절차에서 선택된 14-비트 디지탈 코드 쌍과 두개의 14비트 디지탈 코드를 결합하고, 이러한 선택 절차를 반복하는 절차, (c) 절차(a)에서 선택된 14비트 디지탈 코드중에서, 제 1 비트가 “0”이고 CDS의 값이 -2인 디지탈 코드와 제 1 비트가 “1”인 CDS의 값이 +2 또는 +4인 또 하나의 디지탈 코드를 선택하고, 4개의 디지탈 코드를 1그룹으로 만들기 위하여 두개의 선택된 14비트 디지탈 코드와 그것의 반전 코드를 결합하고, 이러한 선택 절차를 반복하는 절차, (d) 절차(a)에서 선택된 14비트 디지탈 코드중에서, 제 1 비트가 “0”이고 CDS 값이 +4인 디지탈 코드와 제 1 비트가 “1”이고 CDS 값이 +2인 또 하나의 디지탈 코드를 선 Selecting a digital code, and combining the selected 14-bit digital codes with the reversal codes thereof, and further to make the 4 digital codes one group bonded to the 14-bit digital codes with a pair of two 14-bit digital codes selected at the procedure, and , in this selection procedure, the procedure, (c) process the 14-bit digital codes selected in (a) of repeating, the first bit is "0", the digital code and the first bit the value of the CDS is -2, "1", the value of CDS select another digital code the +2 or +4, and combining the two selected 14-bit digital codes with the reversal codes thereof to make the 4 digital codes to the first group, and repeating this selecting procedure in which process, (d) steps (a) 14-bit digital codes selected at the first bit is "0" and the CDS value of +4 and a digital code the first bit is "1" and also the CDS value is +2 select one of the digital code 하고, 4개의 디지탈 코드를 1그룹으로 만들기 위하여 두개의 선택된 14비트 디지탈 코드와 그것의 반전 코드를 결합하고, 이러한 선택 절차를 반복하는 절차, 및 (e) 상기 절차들에서 형성된 그룹들중 256 그룹을 14비트 디지탈 변조 코드로서 선택하는 절차에 의해 선택된 14비트 디지탈 변조 코드를 4개까지 선택하는 단계 1과 ; And, combining the two selected 14-bit digital code and its inverted code to make the four digital code to the first group, and repeating this selecting procedure, process, and (e) 256 groups of the groups formed in the above procedure the step of selecting up to four 14-bit digital modulation code selected by the process of selecting a 14-bit digital modulation code 1; 14비트 디지탈 변조 코드의 256 그룹중에서 입력된 8-비트 디지탈 데이타에 해당하는 한 그룹의 14비트 디지탈 변조 코드를 선택하는 단계 2와 ; Selecting one group of 14-bit digital modulation code corresponding to the 8-bit digital data input from the 256 groups of the 14-bit digital modulation code 2 and; 이미 선택된 선행의 14비트 디지탈 변조 코드와 선택될 14비트 디지탈 변조 코드의 결합부에서 연속한 동일 비트수가 2-7이라는 필요 요건을 만족시키는 하나 도는 그 이상의 14-비트 디지탈 변조 코드를 단계 2에서 선택된 그룹에서 더 선택하는 단계 3 ; Already turning one that satisfies the 14-bit digital modulation code and the need of the same bit number of 2-7 consecutive requirements in coupling part of the 14-bit digital modulation code to be selected in the selected 14-bit digital modulation prior more code selected in step 2, step further selected from the group 3; 하나의 14비트 디지탈 변조 코드가 변조 코드의 각 비트에서의 DSV(이하에서 비트 DSV라 함)의 절대값이 7과 같거나 또는 작다는 필요 요건을 만족하도록 단계 3에서 선택된 변조 코드들 중에서 하나의 14비트 디지탈 변조 코드를 더 선택하는 단계 4를 포함한다. In step 3 so as to satisfy one of the requirements of 14-bit digital modulation code the absolute value of the DSV (la bit DSV hereinafter hereinafter) in each of the bits of the modulation codes equal to 7 or less in one of the selected modulation code a 14-bit digital modulation code comprises the step 4 further selection. 본 발명의 제 2 양상에 따르면, 8비트 디지탈 데이타를 14비트 디지탈 변조 코드로 변환하는 디지탈 변조방법은, (a) 2 14 14-비트 디지탈 코드중에서, 연속한 동일 비트의 수가 제1의 7비트에서는 6 이하이고 제 2 비트에서 제13비트까지에서는 2-7이고 마지막 6비트에서는 5 이하인 디지탈 코드를 선택하고, 이러한 선택 절차를 반복하는 절차, (b) 절차 (a)에서 선택된 14비트 디지탈 코드중에서, 제 1 비트가 “0”이고 CDS 가 6과 같거나 또는 작은 절대값을 갖고 있는 디지탈 코드를 선택하고, 이러한 선택 절차를 반복하는 절차,(c) 절차(a)에서 선택된 14비트 디지탈 코드 중에서, 제 1 비트가 “0”이고 CDS 가 4와 같거나 또는 4보다 작은 절대값을 갖고 있는 디지탈 코드를 선택하고, 이러한 선택 절차를 반복하는 절차, (d) 절차(a)에서 선택된 14비트 디지탈 코드중에 According to a second aspect of the invention, 8-bit digital modulation method for converting digital data into 14-bit digital modulation code is, (a) 2 14 14- bit digital code from the 7 bits of the number of consecutive identical bits first in 6 or less in the first 2 bits to the 13 bits 2-7 and the process for the last 6-bit less than or equal to 5, select the digital code, and repeating this selecting procedure, (b) steps (a) 14-bit digital codes selected at among them, the first bit is "0" and the process of CDS is equal to 6 or select the digital code that has a small absolute value, and repeating this selecting procedure, (c) steps (a) 14-bit digital codes selected at among them, the first bit is "0" and the process of CDS selects a digital code which has a small absolute value equal to 4 or greater than 4, and repeating this selecting procedure, (d) process 14 bits selected from (a) the digital code , CDS 값은 0인 디지탈 코드를 선택하고, 그 디지탈 코드를 1그룹으로 만들기 위해서 선택된 14비트 디지탈 코드와 그의 반전 코드를 쌍으로 하고, 이러한 선택 절차를 반복하는 절차, (e) 절차(a)에서 선택된 14비트 디지탈 코드중에서, CDS 값이 +2, +4 또는 +6인 디지탈 코드를 선택하고, 절차(C)에서 선택된 14비트 디지탈 코드중에서, CDS 값이 +2 또는 +4인 디지탈 코드를 선택하고, 4 디지탈 코드를 한 그룹으로 만들기 위해 두개의 선택된 14비트 디지탈 코드와 그의 반전 코드를 결합하고, 이러한 선택 절차를 반복하는 절차 및, (f) 상기 절차들에서 형성된 그룹들중에서 256 그룹을 14비트 디지탈 변조 코드로서 선택하는 절차에 의해 선택된 14비트 디지탈 변조 코드를 4개까지 선택하는 단계 1과 ; , CDS value is selected to 0, the digital code, and to make a digital code to the first group and the selected 14-bit digital code and its inverted code in pairs, the procedure of repeating this selecting procedure, and (e) steps (a) of 14-bit digital codes selected from, CDS value is +2, +4 or +6 is selected digital codes, and the process of 14-bit digital codes selected at (C), a digital code the value of CDS of +2 or +4 selecting, 4 to combine the two selected 14-bit digital code and its inverted code to create the digital codes one group, and repeating this selecting procedure steps and, and (f) the 256 groups among the groups formed in the above procedure a 14-bit digital modulation code selected by the process of selecting a 14-bit digital modulation code, the method comprising: selecting one and up to four; 14비트 디지탈 변조 코드의 256 그룹중에서 입력된 8-비트 디지탈 데이타에 해당하는 한 그룹의 14비트 디지탈 변조 코드를 선택하는 단계 2와 ; Selecting one group of 14-bit digital modulation code corresponding to the 8-bit digital data input from the 256 groups of the 14-bit digital modulation code 2 and; 이미 선택된 선행의 14-비트 디지탈 변조 코드와 선택될 14비트 디지탈 변조 코드와의 결합부에서 연속한 동일 비트수가 2-7이라는 필요 요건을 만조시키는 하나 또는 그 이상의 14-비트 디지탈 변조 코드를 단계 2에서 선택된 그룹에서 더 선택하는 단계 3 및 ; Phase of one or more 14-bit digital modulation code that has already a high water 14-bit digital modulation code and the same number of bits 2-7 in the requirement of a continuous connecting portion of the 14-bit digital modulation code to be selected of the selected preceding 2 step further selected from the selected group in the 3 and; 하나의 14비트 디지탈 변조 코드가 변조 코드의 비트 DSV의 절대값이 8과 같거나 8보다 작다는 필요 요건을 만족시키도록 단계 3에서 선택된 변조 코드중에서 하나의 14비트 디지탈 변조 코드를 더 선택하는 단계 4를 포함한다. Further comprising: a 14-bit digital modulation code is further selecting one 14-bit digital modulation code among the selected modulation codes at step 3 so as to satisfy the requirements when the absolute value of bit DSV of the modulation code is equal to 8, or smaller than 8, and a 4. 이하 첨부도면을 참조하여 본 발명을 설명한다. Reference to the accompanying drawings, the present invention will be described. 제1도는 본 발명의 디지탈 변조 방법의 제 1 실시예에 따라 디지탈 변조를 실행하는 디지탈 변조 장치를 보여주는 블록 다이어그램이다. The first is a turning block diagram showing a digital modulation apparatus for executing a digital modulation according to the first embodiment of the digital modulation method of the present invention. 제1도에서, 8비트 디지탈 데이타(1)은 엔코더(2)에 의해 14비트 디지탈 변조 코드로 변환된다. In FIG. 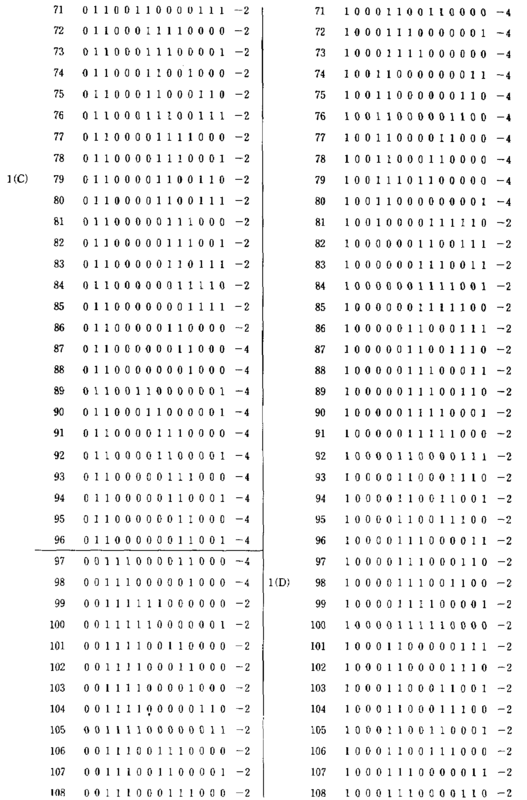 1, an 8-bit digital data 1 is converted into 14-bit digital modulation code by an encoder (2). 엔드 패턴(end pattern) 판단부(3)는 14비트 디지탈 변조 코드의 마지막 6비트의 엔드 패턴을 테이블 9에 있는 4비트 코드로 변환시킨다(변조 코드의 마지막 8비트가 테이블 9에 주어져 있을지라도 단지 마지막 6비트만이 고려되어야만 한다). 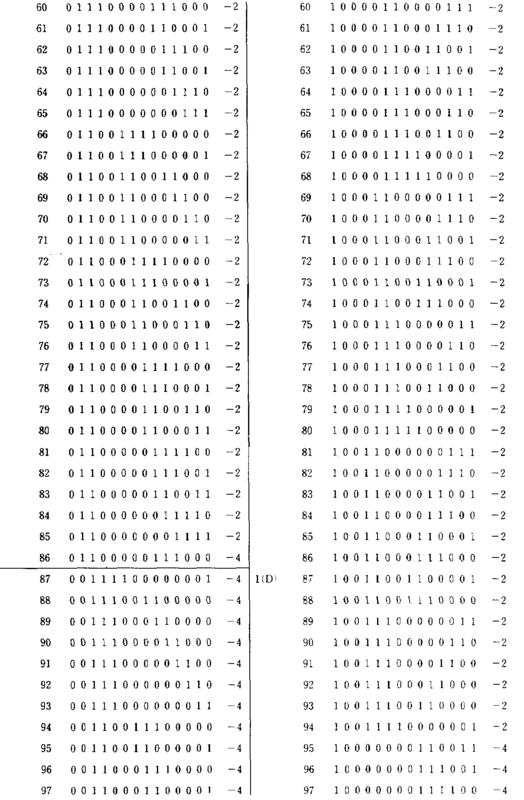 End pattern (end pattern), the determination unit (3) is even if the last eight bits of the converts the end pattern of the last six bits of the 14-bit digital modulation code into a 4-bit code in Table 9 (a modulation code is given in table 9 only The last 6 bits should be considered only). 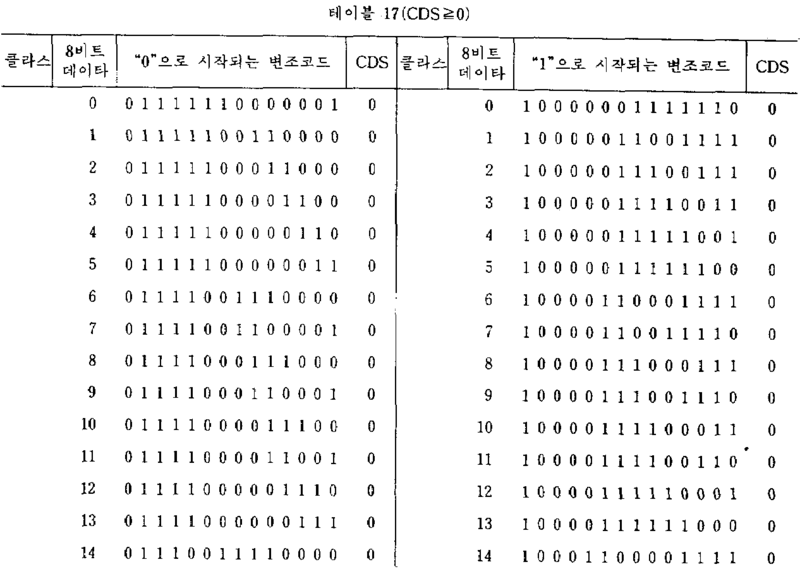 CDS 계산부(5)는 제공된 14비트 디지탈 변조 코드의 CDS를 계산하고 계산된 CDS를 테이블 7에 있는 3비트 코드로 변환시킨다. 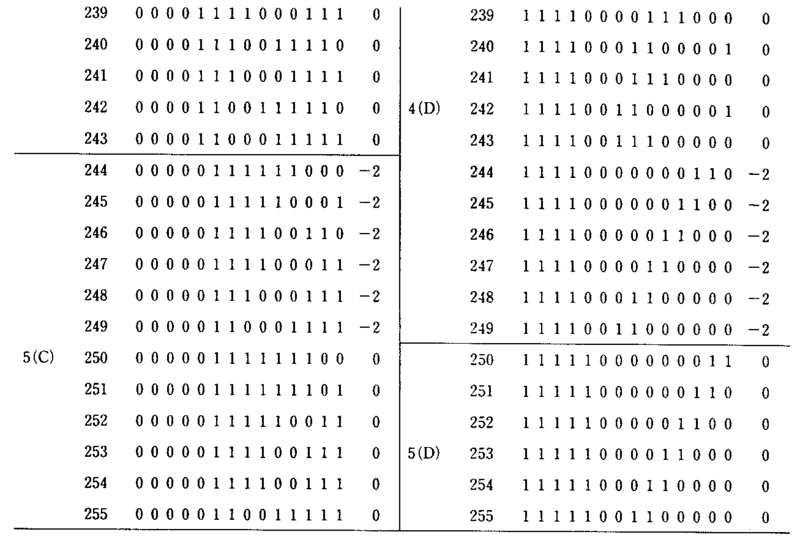 CDS calculation portion 5 converts the calculated CDS of the 14-bit digital modulation code supplied to the CDS calculating the 3-bit code in Table 7. DSV 계산부(4)는 선행 14비트 디지탈 변조 코드의 단부에서 현행 14비트 디지탈 변조 코드의 CDS를 DSV에 가산하여 새로운 DSV를 만들어내며, 이 새로운 DSV를 테이블 8에 있는 2비트 코드로 변환시킨다. DSV calculation portion 4 produces a new DSV by adding the current 14-bit digital modulation code CDS at the end of the preceding 14-bit digital modulation code to the DSV, and converts the new DSV into a 2-bit code in Table 8. 병렬-직렬 변환기(8)는 14비트 디지탈 변조 코드를 클럭 신호(9)와 동기되는 직렬 신호로 변환시킨다. Parallel-to-serial converter 8 converts a serial signal synchronized with a 14-bit digital modulation code and the clock signal (9). 기록부(10)는 자기테이프 등과 같은 기록 매체상에 병렬-직렬 변환기(8)로부터 생성된 직렬 변조 신호를 기록한다. Recording unit 10 is parallel to the recording medium such as a magnetic tape-records the serial modulation signal produced from the serial converter 8. 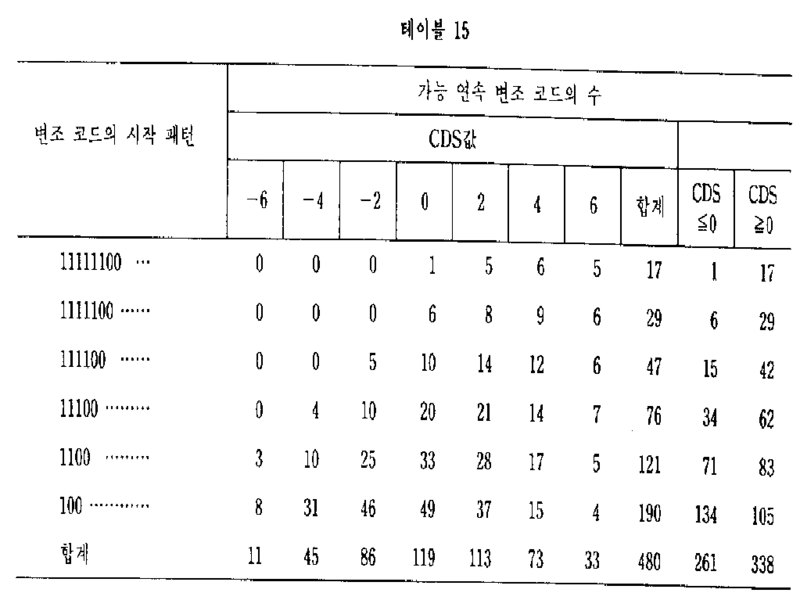 CDS 계산부(5)의 출력 코드는 DSV 계산부(4)에 공급된다. The output code of the CDS calculation portion 5 is supplied to the DSV calculation portion (4). DSV 계산부(4)는 코드를 래치(6)를 경유해 엔코더(2)에 공급한다. DSV calculation portion 4 supplies the encoder 2 to a code via a latch (6). 엔드 패턴 판단부(3)는 코드를 래치(7)를 경유해 엔코더(2)에 제공한다. End pattern judgment portion 3 to the code via a latch (7) and provides it to the encoder (2). 다음에는, 각각의 입력된 8비트 디지탈 데이타에 대응하는 14비트 디지탈 변조 코드를 선택하는 방법에 대해 설명하기로 한다. Next, description will be made on how to select the 14-bit digital modulation code corresponding to each inputted 8-bit digital data. (e) 상기 절차에서 형성된 그룹중에서 256그룹을 14비트 디지탈 변조 코드로서 선택하는 절차에 의해 선택된다. (E) the 256 groups of the group formed in the above process are selected by a process of selecting a 14-bit digital modulation code. 다음에는 입력된 8비트 데이타에 대응하는 14비트 디지탈 변조 코드(현행 변조 코드)의 선택 절차에 대해 설명하기로 한다. Next, description will be made to the selection procedure of a 14-bit digital modulation code corresponding to the inputted 8-bit data (current modulation code). 먼저, 선행 변조 코드의 단부에서 DSV가 계산되고, 선행 변조 코드의 엔드 패턴은 테이블 9에 도시된 12개의 엔드 패턴중 하나로서 결정된다. First, the DSV is calculated at the end of the preceding modulation code and the end pattern of the preceding modulation code is decided as one of the twelve end patterns shown in Table 9. 후속해서, 현행 14비트 디지탈 변조 코드는 8비트 데이타, 선행 변조 코드의 단부에서의 DSV 및 선행 변조 코드의 엔드 패턴에 응답하여 엔코더(2)에 의해 선택된다. 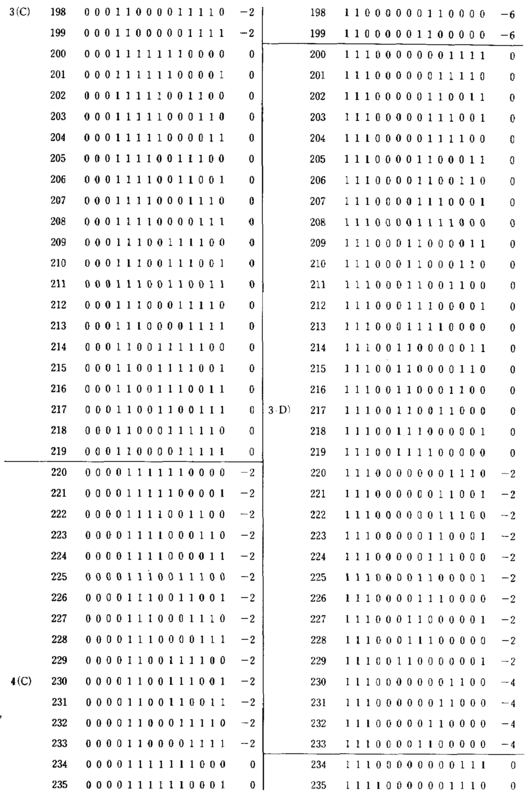 Subsequently, the current 14-bit digital modulation code is selected by 8-bit data, the encoder (2) in response to the DSV of the preceding modulation code and the end pattern of the preceding modulation code ends. 좀더 상세하게는, 현행 14비트 디지탈 변조 코드를 선택하는데 다음의 단계들이 취해진다. More particularly, the following steps are taken for the current to choose the 14-bit digital modulation code. (1) 다음의 조건을 만족하는 14비트 디지탈 변조 코드는 테이블 4 및 5에서 선택된다 : (a) 선행 14비트 디지탈 변조 코드와의 결합부에서 연속한 동일 비트수는 2개의 내지 7개이고 : (b) 디지탈 변조 코드의 단부에서의 DSV(이하 엔드 DSV라 함)의 절대값은 2와 같거나 2보다 작다. 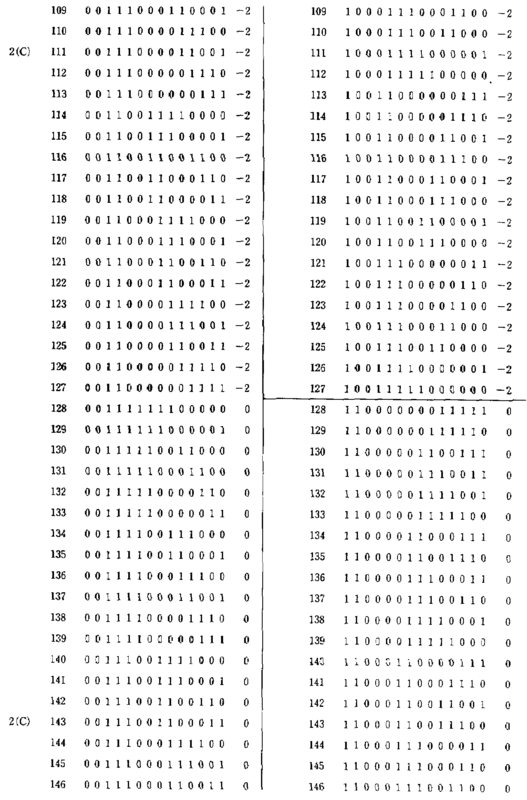 (1) 14-bit digital modulation codes satisfying the following conditions are selected from Tables 4 and 5: (a) be the same bit continuous in the coupling portion of the preceding 14-bit digital modulation code is two to seven numbered ( b) the absolute value of the DSV (hereinafter referred to as the end DSV hereinafter) at the end of the digital modulation code is equal to 2 or less than 2. (2) 2이상의 14비트 디지탈 변조 코드가 단계(1)에서 선택될때, 엔드 DSV의 최소 절대값을 주는 14비트 디지탈 변조 코드가 선택된다. 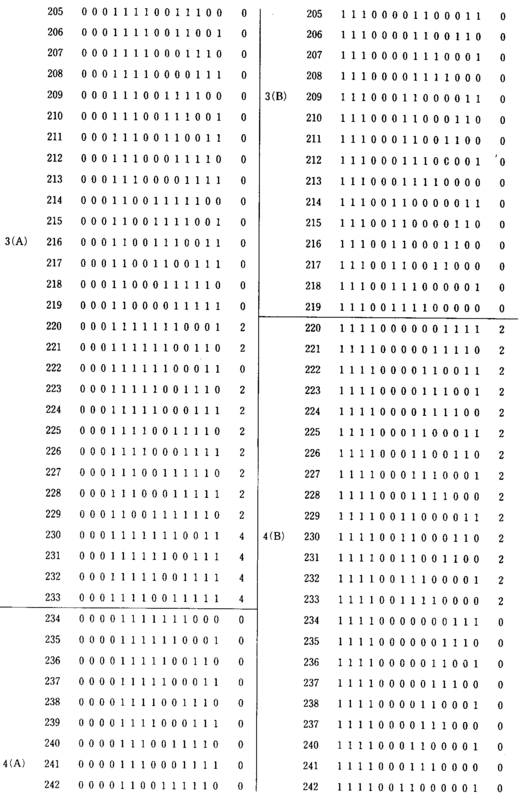 (2) When two or more selected from the 14-bit digital modulation codes the step (1), the 14-bit digital modulation code to the lowest absolute value of the end DSV is selected. (3) 2이상의 14비트 디지탈 변조 코드가 단계(2)에서 아직 선택되고 있을때, 14비트 디지탈 변조 코드는 변조 코드의 비트 DSV를 계산하고, 절대값이 각각의 변조 코드에 대해서 최소인 비트 DSV를 판정하고, 절대값이 최소인 비트 DSV들중에서도 최소의 비트 DSV를 포함하는 코드를 선택하므로써 선택된다. 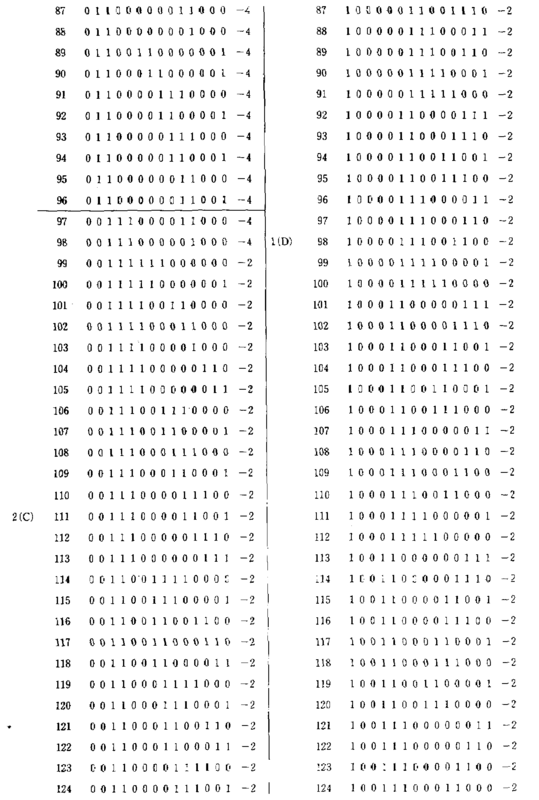 (3) at least the bit DSV for when yet select from two or more 14-bit digital modulation codes the step (2), 14-bit digital modulation code is calculated for bit DSV of the modulation code, and the absolute value of each of the modulation code determination, and is selected By selecting the code including the bit DSV of the minimum among the absolute values ​​of the DSV bit minimum. (4) 2이상의 14비트 디지탈 변조 코드가 단계(3)에서 더 발견될때, 14비트 디지탈 변조 코드는 각각의 변조 코드의 비트 DSV의 최대 절대값을 구하고, 최대 절대값이 6 또는 그 이하인 비트 DSV를 포함하는 코드를 선택하므로써 선택된다. 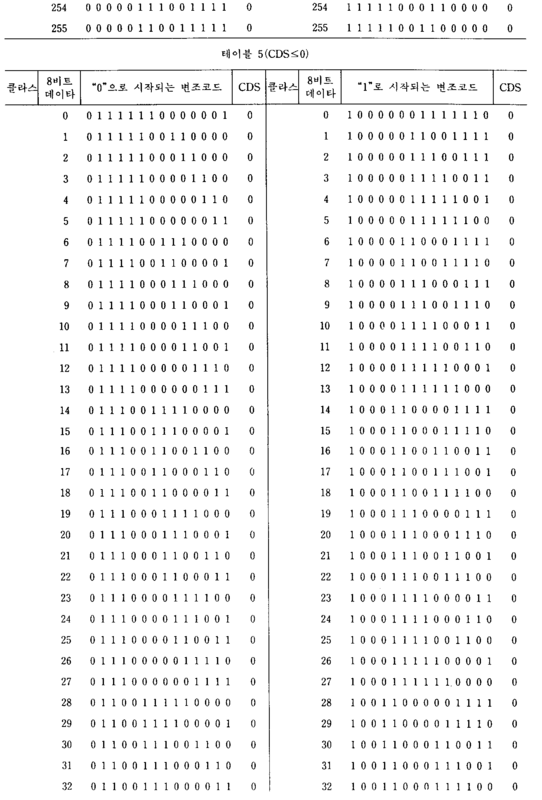 (4) when more found in two or more 14-bit digital modulation code is step 3, the 14-bit digital modulation code to obtain the maximum absolute value of the bit DSV of each modulation code, the maximum absolute value of 6 or lower bit DSV It is selected By selecting a code comprising a. (5) 2이상의 변조 코드가 단계(4)에서 아직 발견될때, 선행 14비트 디지탈 변조 코드와의 결합부에서 연속한 동일 비트수가 6 또는 그 이하라는 조건을 만족하는 14비트 디지탈 변조 코드가 선택된다. 5, when still found in the step of two or more modulation code (4), the preceding 14-bit digital modulation code and the 14-bit digital modulation code satisfying the condition that the same number of bits is 6 or less continuous in the coupling part are selected in . (6) 단계(4)에서 선택된 코드중 어떤 변조 코드도 단계(5)를 만족하지 못할때, 또는 2이상의 변조 코드가 단계(5)를 만족하지 못할때는, 상기 변조 코드내의 연속할 동일 비트가 6 또는 그 이하인 조건을 만족하는 14비트 디지탈 변조 코드가 선택된다. 6, step 4 at when not satisfying, or two or more modulation codes the step (5), when not satisfied, the step (5) any modulation code of the selected code, the same bits to be continuous in the modulated code is the 14-bit digital modulation code satisfying the condition 6 or less is selected. (7) 단계(4)에서 선택된 코드중 어떤 변조 코드도 단계(5) 및 (6)을 만족하지 못할때, 또는 단계(5)에서 선택된 변조 코드 어느것도 단계(6)를 만족하지 못할때, 또는 2이상의 변조 코드가 단계(6)에서 더 발견될 때는, 다음의 단계들이 취해진다. (7) when the step (4) does not meet the modulation code neither step 6 is selected from the time any modulation code of the selected code is also not satisfied, the step (5) and (6), or step (5) in, when two or more modulation code is further found in step (6), it is taken to the next step. (7a) 변조 코드의 엔드 DSV가 -2일때, 코드 우선순위(테이블 10에서 작은 수일수록 순위가 높음)가 테이블 10에 따라서 선택된다. 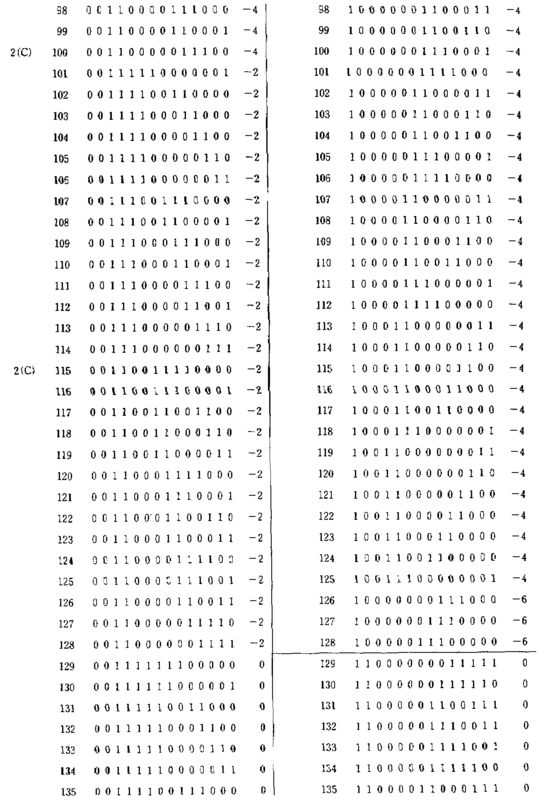 (7a) when the end DSV of the modulation code is -2, the code is selected according to the priority table 10 (the lower the number in Table 10 the high priority). 비슷한 식으로, 변조 코드의 엔드 DSV가 +2일때, 코드 우선순위는 테이블 11에 따라서 선택된다. 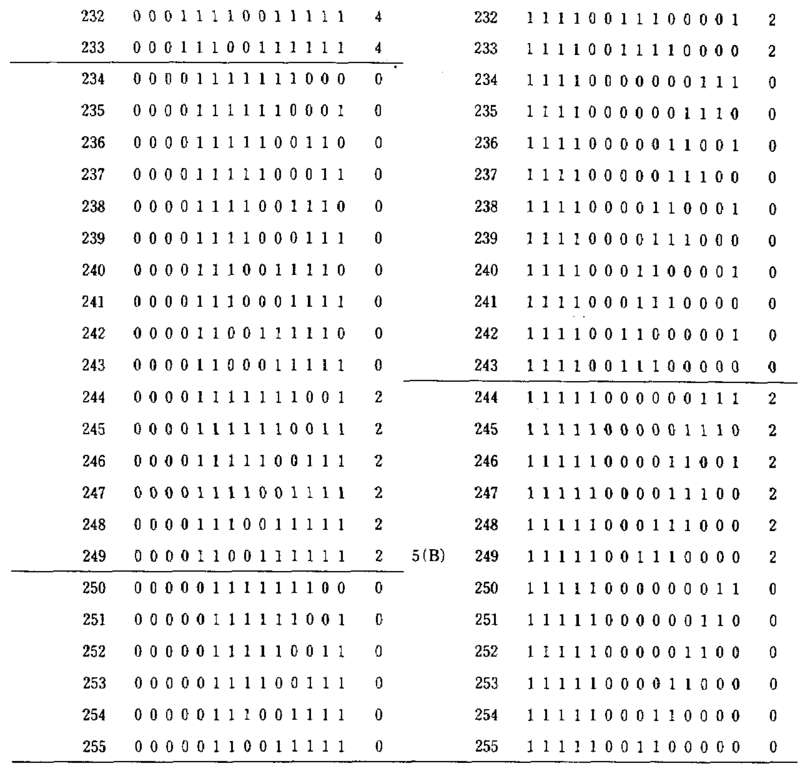 In a similar manner, the end DSV of the modulation code is + 2 when, coding, priority is selected according to Table 11. (7b) 동일한 가장 빠른 우선순위에 속하는 2이상의 변조 코드가 단계(7a)에서 발견될때, 그들 모두는 일시에 선택된다. (7b) when found in the same earliest priority stage two or more modulation code (7a) belonging to, all of which are selected at a time. 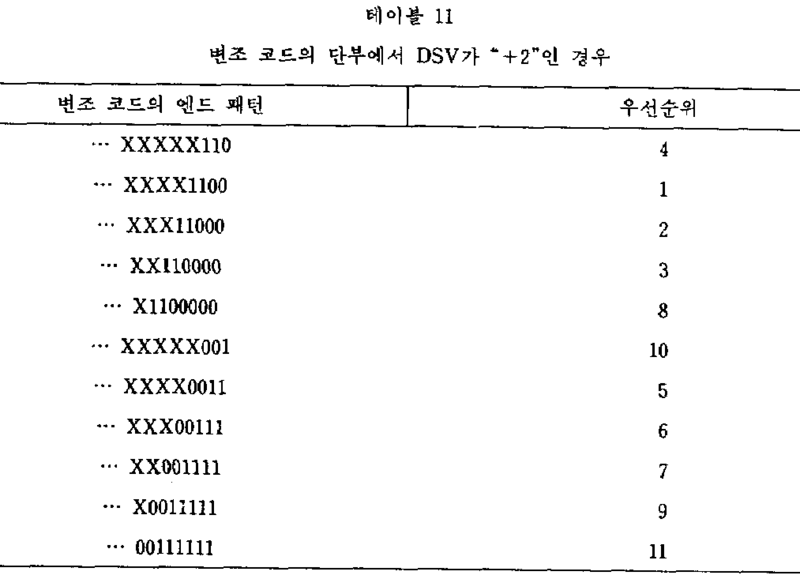 엔드 DSV가 0일때, 마지막 6비트가 변조 코드에서 “… End DSV is zero, the last six bits in the modulation code "... 111111” 또는 “… 111111 "or" ... 000000”이 아님을 만족하는 변조 코드가 선택된다. 000000, "the modulation code satisfying this is not selected. 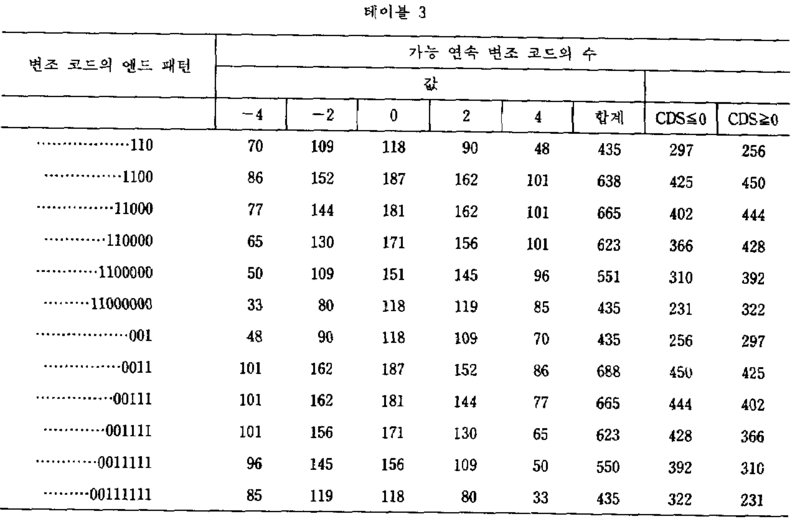 (8) 단계(4)에서 선택된 변조 코드 어느것도 단계(5), (6) 및 (7)을 만족하지 못할때, 또는 단계(5)에서 선택된 변조 코드 어느것도 단계(6) 및 (7)을 만족하지 못할때, 또는 단계(6)에서 선택된 변조 코드 어느것도 단계(7)를 만족하지 못할때, 또는 2이상의 변조 코드가 단계(7)에서 더 발견될때는 비트 DSV의 최대 절대값중 최소의 비트 DSV를 포함하는 변조 코드가 선택된다. 8, also in step (4) which the selected modulation code, step (5), (6) and (7) to prevent time, or step (5) None of step (6) and (7) a selected modulation code is not satisfied when not satisfied, or when the step (6) does not meet a selected modulation code, none step (7), the or at least one further found a maximum absolute value of when the bit DSV at the stage of two or more modulation code (7) of the modulation code is selected that contains the bit DSV. (9) 2이상이 변조 코드가 단계(8)에서 아직 발견될대, 최소 절대값이 변조 코드의 비트 열(bit string)에서 가장 빠르게 나타나는 비트 DSV를 포함하는 변조 코드가 선택된다. 9, the modulation code is selected for two or more modulation code is two, the minimum absolute value is still found at step (8), including the most rapidly appearing DSV bit in the bit string (bit string) of the modulation code. (10) 2이상의 변조 코드가 단계(9)에서 더 발견될때, 선행 변조 코드와의 결합부 다음에서 비트가 가장 빠르게 반전되는 변조 코드가 선택된다. (10) When two or more modulation codes are further found at step (9), the modulation code, the bit is the fastest reversal is selected from the engagement portion, and then the preceding modulation code. 그렇게 선택된 14비트 디지탈 변조 코드는 병렬-직렬 변환기(8)에 공급된다. So 14-bit digital modulation code is selected, the parallel-serial converter is supplied to the (8). 병렬-직렬 변환기(8)에 들어간 변조 코드는 클럭(9)와 동기되어 직렬로 판독된다. Parallel-to-modulation code into a serial converter 8 in synchronization with the clock (9) is read out in series. 여기서 14비트 디지탈 변조 코드는 자기테이프 등과 같은 기록 매체에 기록된다. 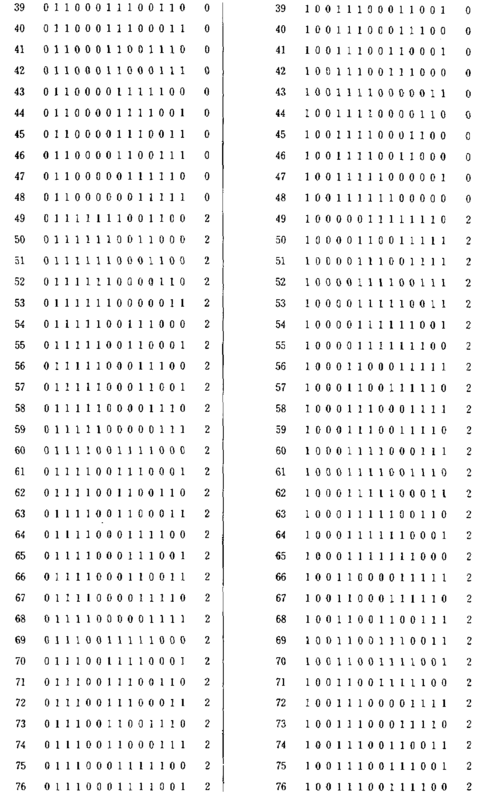 The 14-bit digital modulation code is recorded in a recording medium such as a magnetic tape. 한편, 엔코더(2)에 의해 선택된 14비트 디지탈 변조 코드는 DSV 계산부(4)와 엔드 패턴 판단부(3)에 제공된다. 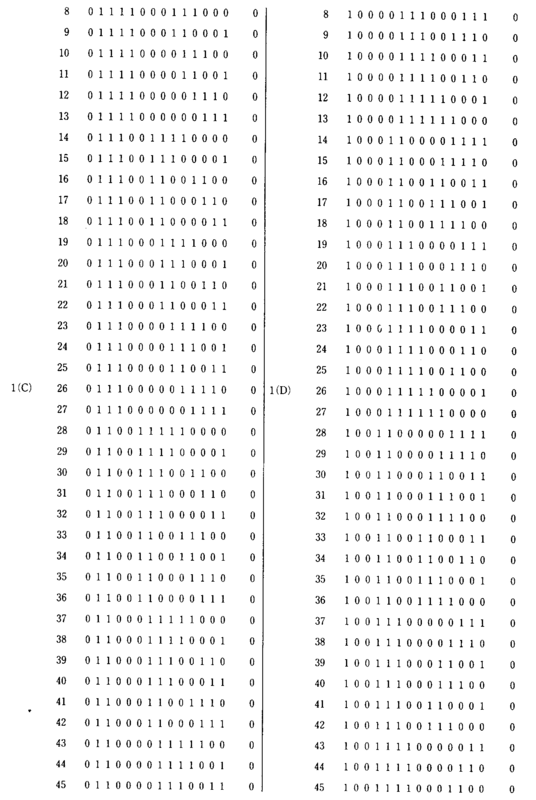 On the other hand, 14-bit digital modulation code selected by the encoder (2) is provided to the DSV calculation portion 4 and the end pattern judgment portion 3. DSV 계산부(4)는 새로운 DSV를 얻기 위해 현행 변조 코드의 CDS를 선행 변조 코드의 단부에 있는 DSV에 가산한다. DSV calculation portion 4 adds the CDS of the current modulation code to obtain a new DSV in DSV at the end of the preceding modulation code. 이 새로운 DSV는 테이블 8에 따라서 2비트 코드로 변환되며 래치(6)를 통해 엔코더(2)에 공급된다. The new DSV is converted into a 2-bit code according to Table 8 are supplied to the encoder 2 via a latch (6). 엔드 패턴 판단부(3)는 14비트 변조 코드의 마지막 6비트를 테이블 9에 따라 4비트로 변환시켜, 이 4비트 코드를 래치(7)를 거쳐 엔코더(2)에 공급한다. End pattern judgment portion 3 supplies the last six bits of the 14-bit modulation code by 4 bits converted in accordance with Table 9, a 4-bit code to the encoder 2 via a latch (7). 상기 절차는 모든 8비트 입력 데이타에 대해 반복된다. The procedure is repeated for every 8-bit input data. 그래서 14비트 디지탈 변조 코드 열이 얻어지고, 여기서 연속한 동일 비트수는 2-7로 제한되고 DSV의 절대값은 7 또는 그 이하로 제한된다. 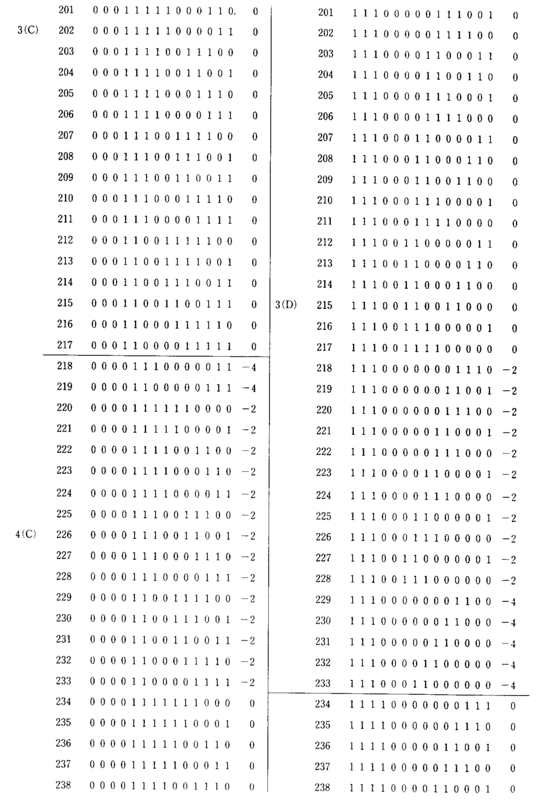 Thus is obtained the 14-bit digital modulation code sequence, the number of consecutive identical bits is restricted to 2-7 where the absolute value of the DSV is limited to 7 or less. 제2도는 디코딩 회로의 한 예를 보여주고 있다. Second turn illustrates an example of a decoding circuit. 제2도에서, 도면 부호 11은 재생부를 가리키고, 12는 동기 신호 검출기를 가리키고, 13은 직렬-병렬 변환기를 가리키고, 14는 디코더를 가리킨다. In FIG. 2, reference numeral 11 denotes playback unit, 12 indicates a synchronization signal detector, 13 is a serial-to-point to parallel converter, 14 denotes a decoder. 디코딩 회로에 의한 디코딩 절차가 이하 설명된다. The decoding procedure by the decoding circuit will now be described. 재생부(11)에 의해 재생된 직렬 변조 코드는 동기 신호 검출기(12)와 직렬-병렬 변환기(13)에 공급된다. The serial modulation code reproduced by the reproducing unit 11, the synchronization signal detector 12 and the serial-to-parallel and supplied to the converter 13. 동기 신호 검출기(12)는 동기 블록의 초기에 삽입된 동기 신호를 검출하여, 그것을 직렬-병렬부(13)에 공급한다. A synchronization signal detector 12 detects the synchronizing signal inserted at the beginning of the sync block, that the serial-parallel and supplied to the unit 13. 동기 신호는 각각의 14비트 디지탈 변조 코드와 동기시키는데 이용된다. Synchronization signal is used to synchronize with each 14-bit digital modulation code. 동기 신호 검출기(12)로부터의 동기 신호를 이용하여, 병렬-직렬 변환기(13)는 14비트 디지탈 변조 코드를 병렬 14비트 디지탈 변조 코드로 변환시켜, 그것을 디코더(14)에 공급한다. Using the synchronization signal from the synchronization signal detector 12, a parallel-to-serial converter 13 converts the 14-bit digital modulation code to a parallel 14-bit digital modulation code, and supplies it to the decoder 14. 디코더(14)는 ROM을 이용함으로써 14비트 디지탈 변조 코드를 대응하는 8비트 데이타를 디코드 한다. 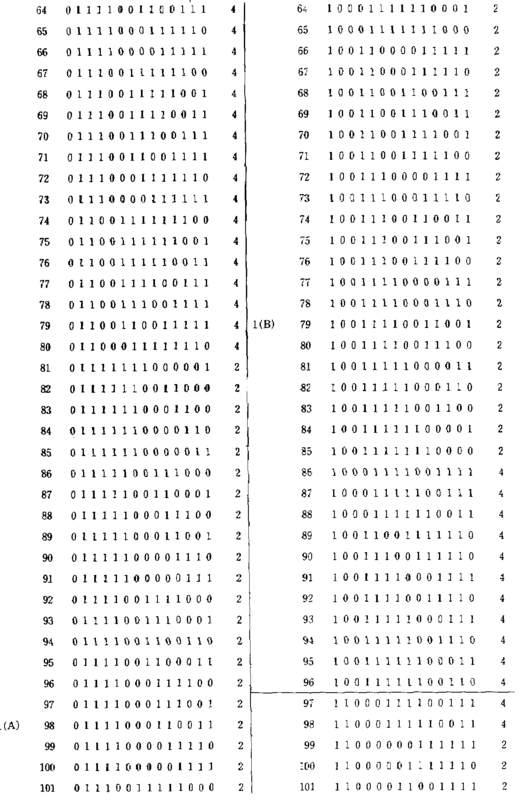 Decoder 14 decodes the 8-bit data corresponding to the 14-bit digital modulation code by using a ROM. (1) 제1의 6비트에서 연속한 동일 비트수는 5 또는 그 이하이다. (1) The number of consecutive identical bits in the six bits of the first is 5 or less. (2) 제2비트에서 제13비트까지에 포함되어 있는 연속한 동일 비트수는 2-7이다. (2) The number of consecutive identical bits in which are included in the second bit to the 13th bit is 2-7. (3) 마지막 7비트에 포함되어 있는 연속한 동일 비트수는 6 또는 그 이하이다. (3) the number of consecutive identical bits included in the last 7 bits is 6 or less. (4) 변조 코드의 CDS의 절대값은 4 또는 그 이하이다. (4) the absolute value of CDS of the modulation code is 4 or less. 상기 필요 조건(1) 내지 (4)를 만족하는 변조 코드의 엔드 패턴은 다음 12아이템 (A)-(M)으로서 요약 된다. End patterns of the modulation codes that satisfy the above requirements (1) to (4) are the following 12 items (A) - can be summarized as (M). 변조 코드(A)-(M)에 이어지는 변조 코드의 시작은 다음의 아이템중 하나이다. Modulation codes (A) - the beginning of the modulation code following the (M) is one of the following items. 둘째로, 변조 코드(B)에 이어지는 변조 코드의 시작은 다음의 9 아이템(B1)-(B9)중 하나이다. Second, the beginning of the modulation code following the modulation code (B) has the following nine items (B1) - one (B9). 변조 코드(C)에 이어지는 변조 코드의 시작은 다음의 8 아이템(C1)-(C8)중 하나이다. Start of a modulation code following the modulation code (C) is the next eight items (C1) of the-one (C8). 변조 코드(D)에 이어지는 변조 코드의 시작은 다음의 7 아이템(D1)-(D7) 중 하나이다. Start of a modulation code following the modulation code (D) is the following seven items (D1) of the-one (D7). 변조 코드(E)에 이어지는 변조 코드의 시작은 다음의 6 아이템(E1)-(E6) 중 하나이다. The beginning of the modulation code following the code modulation (E) of the following six items (E1) - one (E6). 변조 코드(F)에 이어지는 변조 코드의 시작은 다음의 5 아이템(F1)-(F5)중 하나이다. Start of a modulation code following the modulation code (F) has the following five items (F1) - is one (F5). 변조 코드(G)에 이어지는 변조 코드의 시작은 변조 코드(A1)-(A5)의 반전 패턴중 하나이다. Start of a modulation code following the modulation code (G) is a modulation codes (A1) - is one of the reversal patterns of (A5). 변조 코드(H)에 이어지는 변조 코드의 시작은 변조 코드(B1)-(B9)의 반전 패턴이다. Start of a modulation code following the modulation code (H) is a modulation codes (B1) - is an inverted pattern of (B9). 변조 코드(J)에 이어지는 변조 코드의 시작은 변조 코드(C1)-(C8)의 반전 패턴이다. Start of a modulation code following the modulation code (J) is the modulation codes (C1) - is a reversal pattern of the (C8). 변조 코드(K)에 이어지는 변조 코드의 시작은 변조 코드(D1)-(D7)의 반전 패턴이다. Start of a modulation code following the modulation code (K) is the modulation codes (D1) - is an inverted pattern of (D7). 변조 코드(L)에 이어지는 변조 코드의 시작은 변조 코드(E1)-(E6)의 반전 패턴이다. Start of a modulation code following the modulation code (L) is a modulation codes (E1) - an inversion pattern of (E6). 변조 코드(M)에 이어지는 변조 코드의 시작은 변조 코드(F1)-(F5)의 반전 패턴이다. Start of a modulation code following the modulation code (M) is a modulation codes (F1) - is an inverted pattern of (F5). 필요 조건(1)-(5)를 만족하는 변조 코드의 수는 테이블 1 및 2에 도시되어 있다. 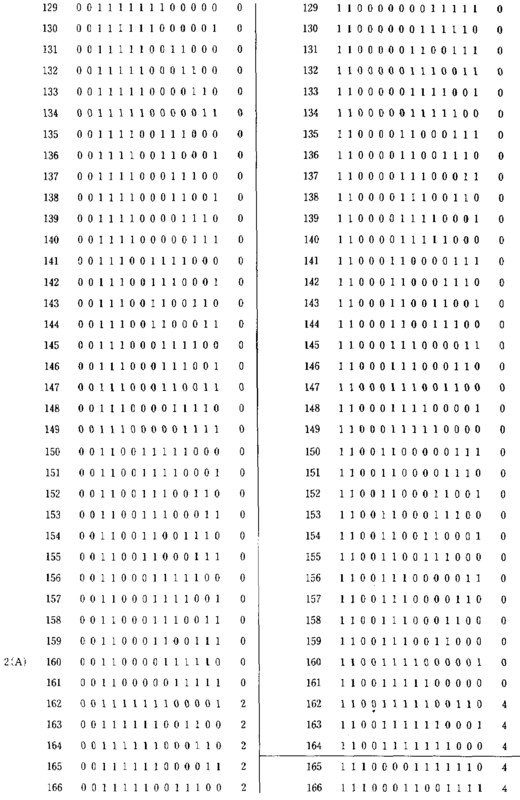 Requirement (1) The number of modulation codes that satisfy the (5) are shown in Tables 1 and 2. 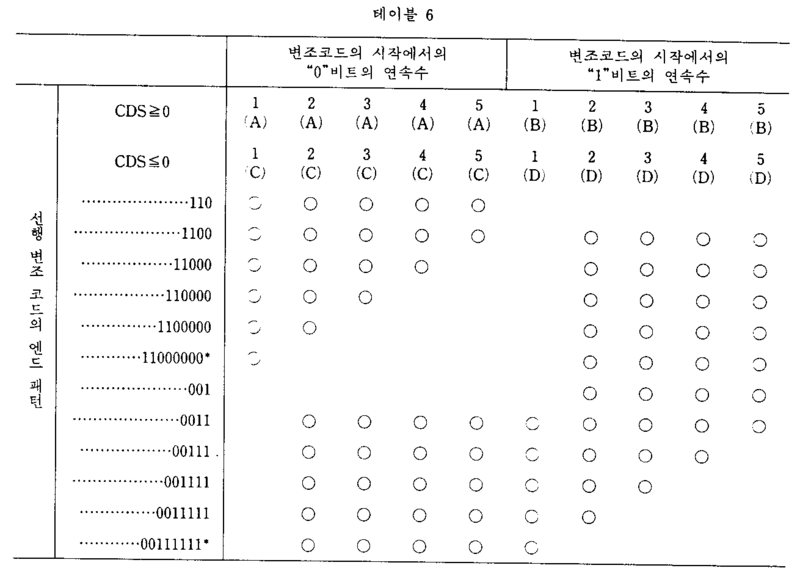 코드 “10000000111111”(CDS=0), 및 코드 “01111111000000”(CDS=0)는 그 수에서 제외되어 있다. The code "10000000111111" (CDS = 0), and the code "01111111000000" (CDS = 0) are excluded from the can. 0인 256개 이상의 변조 코드가 필요한데, 이는 변조 코드(A)-(M) 중 하나를 따른다. 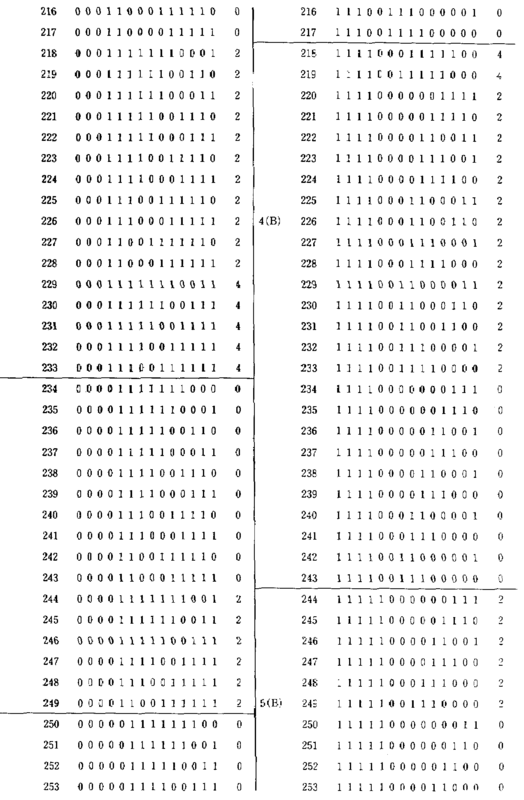 The need of more than 256 0 code modulation, which modulation codes (A) - follows one of (M). 또한 변환된 변조 코드는 전송 에러를 피하기 위해 하나의 8-비트 데이타에 대응해야만 한다. In addition, the converted modulation code must correspond to one 8-bit data to avoid transmission error. 변조 코드(A)-(M)중 하나에 이어질 수 있는 변조 코드수는 테이블 3에서 볼 수 있다. 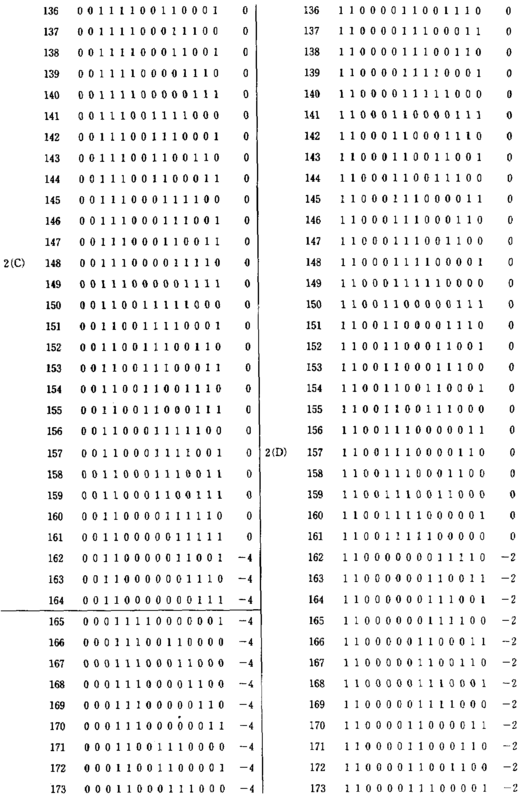 Modulation codes (A) - number modulation code that can lead to one of the (M) is shown in table 3. 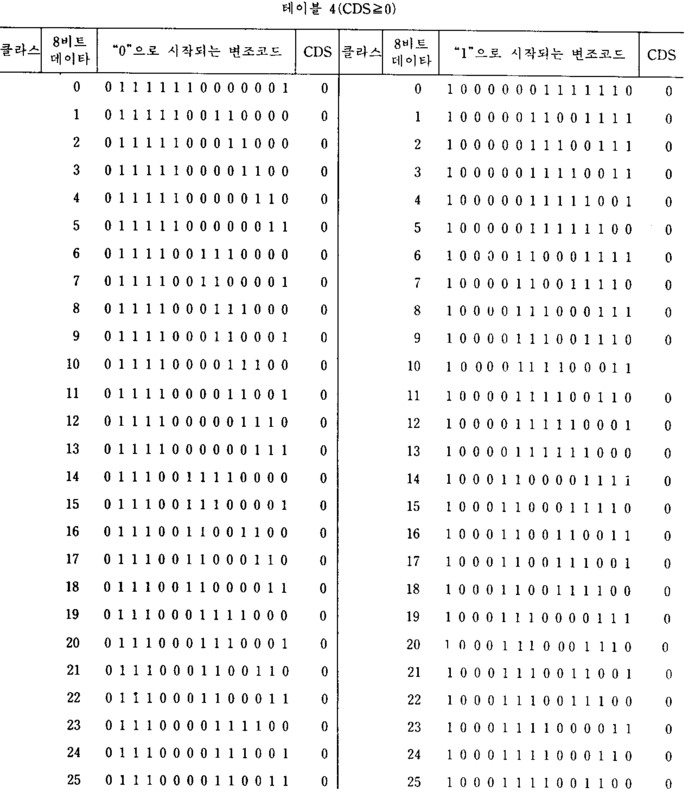 0이라는 필요 조건을 만조해야만 하고, 비트 열 “0000011”, “000011”, “00011”, “0011” 및 “100”중 임의의 하나로 시작되야만 한다. Have high water requirements of 0, the bit string "0000011", "000011", "00011", and should be started only any one of the "0011" and "100". 상기 필요 조건을 만족하는 변조 코드의 수는 테이블 3에 도시되어 있듯이 필요한 256 보다 큰 322이다. 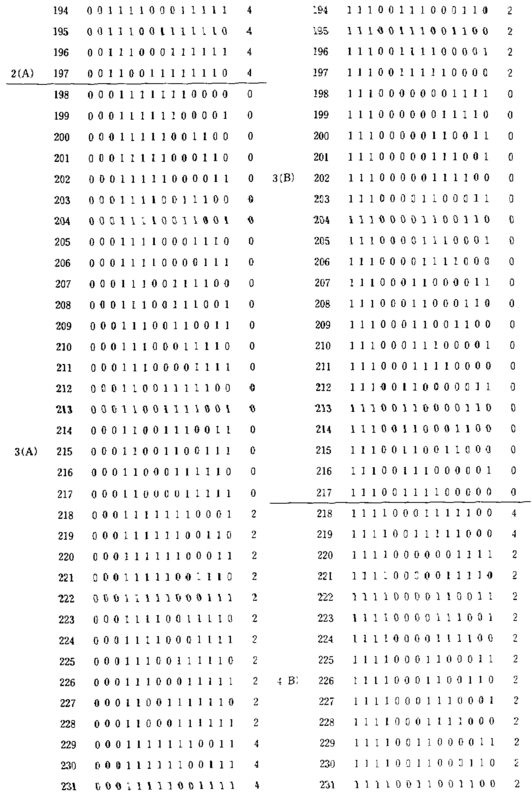 The number of modulation codes that satisfy the above requirement is greater than the required 256 322 As shown in Table 3. 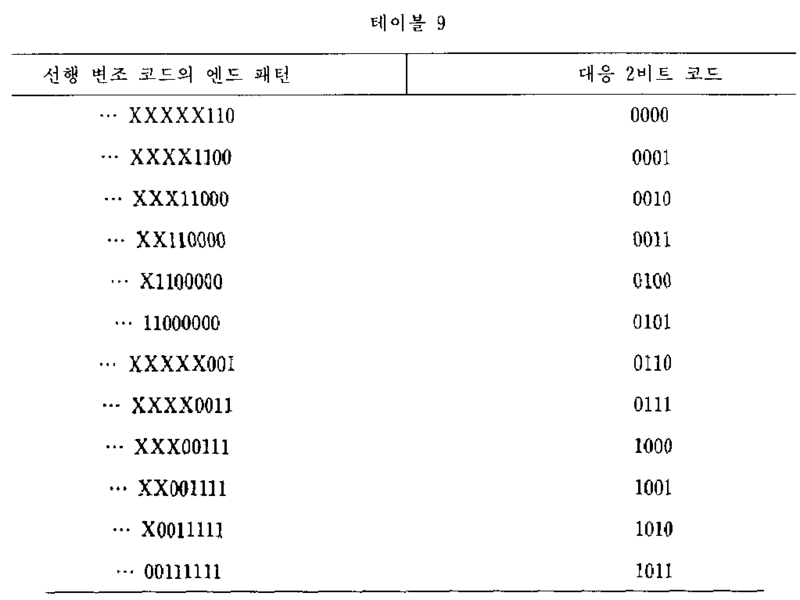 0이라는 필요조건을 만족해야만 하며, 비트 열 “11111100”, “111100”, “11100”“1100”및 “011”중 임의의 하나로 시작되야만 한다. Must satisfy the requirement of 0, the bit string "11.1111 million", "111 100", it should be started only any one of "11100", "1100" and "011". 상기 필요 조건을 만족하는 변조 코드의 수는 테이블 3에 나타나 있듯이 필요한 수인 256보다 큰 322이다. 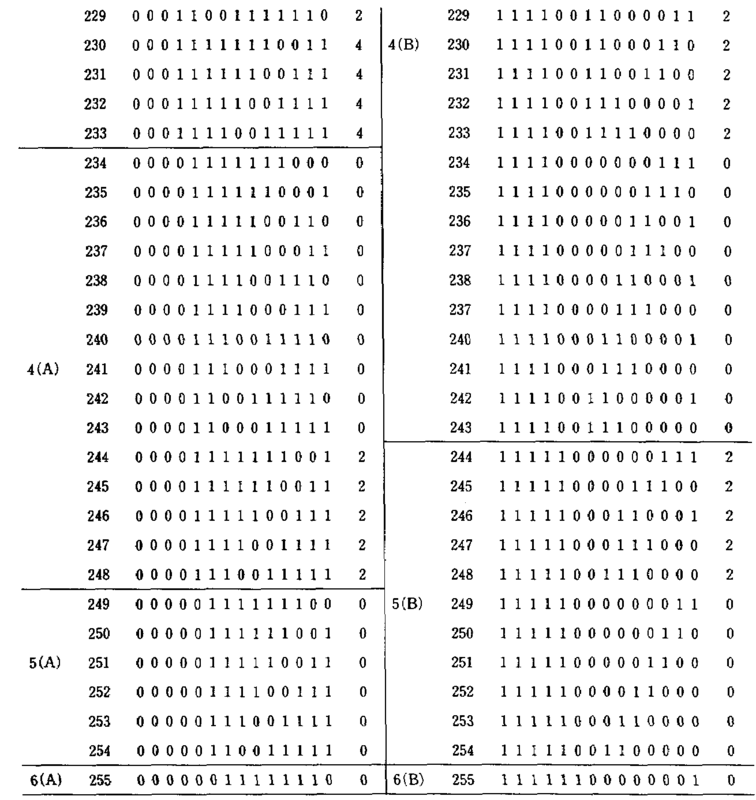 The number of modulation codes that satisfy the above requirement is greater than 256 322 As shown in table 3 the number required. 0일때 각 클라스의 변조 코드수를 보여주고 있따. 0 when ittta shows the number of modulation code of respective classes. 0일때의 대응관계를 보여준다. It shows the correspondence between a 0 when. 테이블(4)의 5(B)에 있는 변조 코드는 엔드 DSV를 향상시키기 위해 테이블 12에 도시되는 대로 바뀔수 있다. 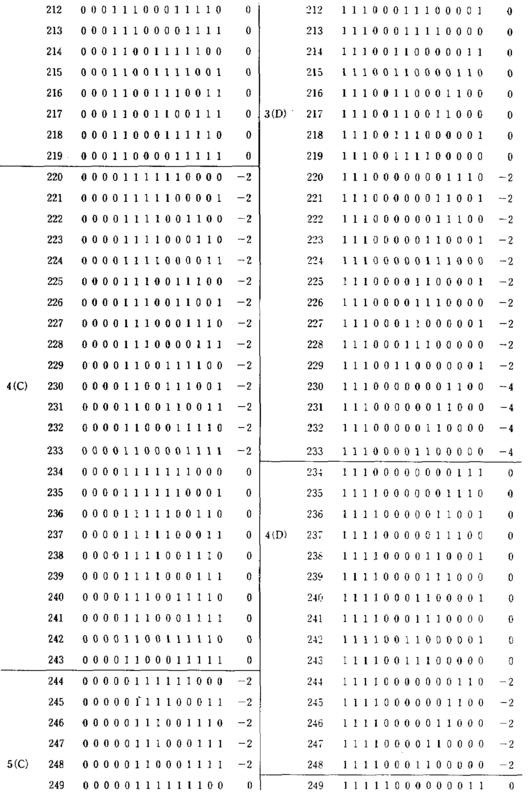 Modulation codes in 5 (B) of Table 4 can be altered as shown in Table 12 to improve the end DSV. 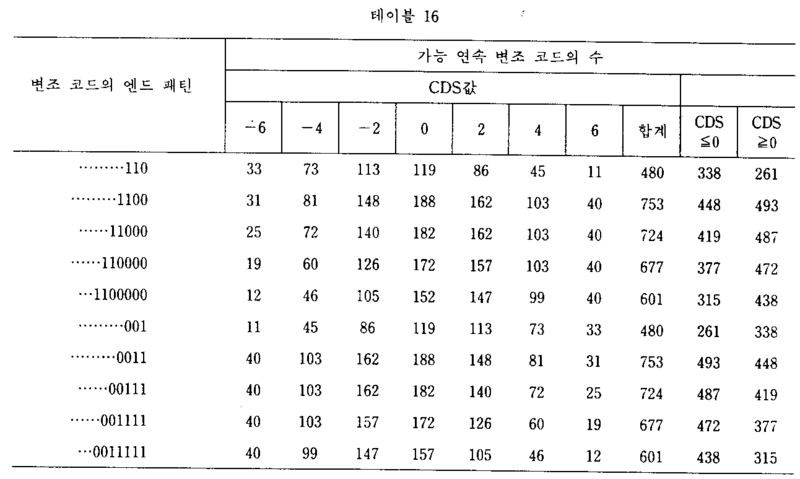 즉 5(B)에서 CDS=0인 6개의 변조 코드는 2개 감소되어 4개로 되고, CDS=2인 사용되지 않았던 두개의 새로운 변조 코드가 부가된다. CDS = 0 i.e. the six modulation codes in 5 (B) is reduced, and two to four, the two new modulation codes that have not been used in CDS = 2 are added. 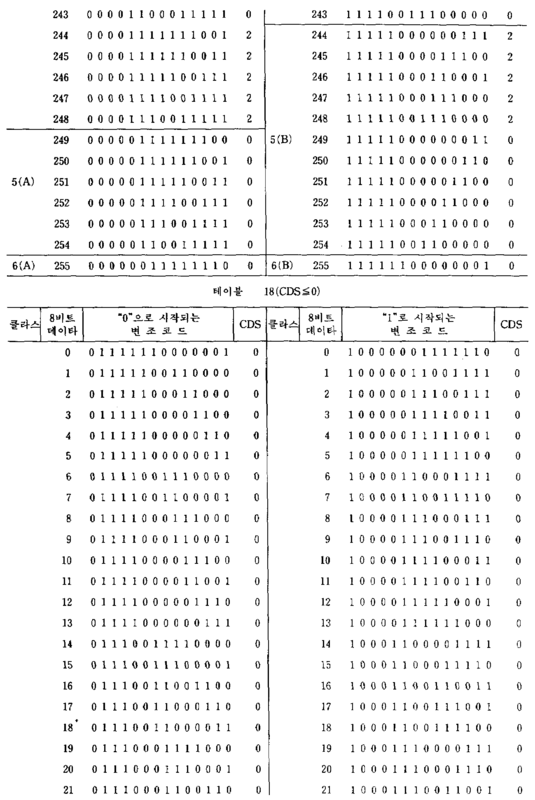 CDS=2인 변조 코드를 선택하면, 선행하는 변조 코드의 엔드 DSV가 -2이고, 선행 코드의 마지막 비트 패턴이 패턴 “01”, “100”, “1000”, “10000”, “100000”, 및 “1000000”중에서 임의의 하나이고, 신호 데이타가 250 또는 251일때, 선택된 변조 코드 끝에서의 엔드 DSV를 0으로 조정할 수 있다. 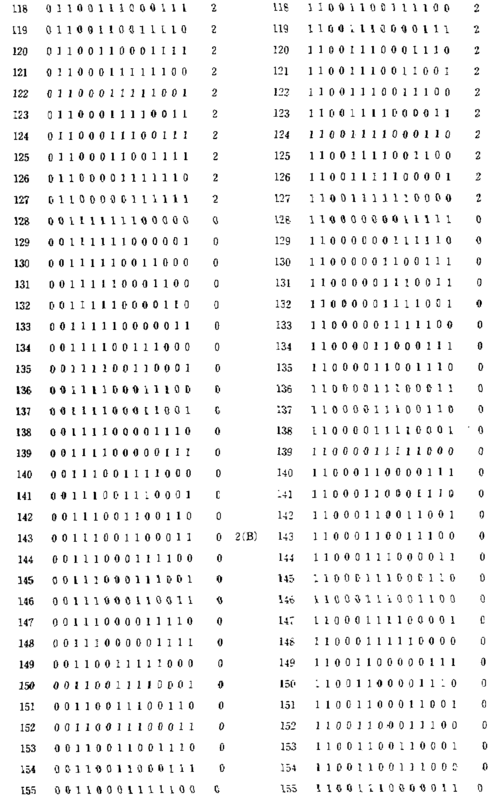 Selecting a modulation code CDS = 2, and the end DSV of the preceding modulation code is -2, the last bit pattern of the preceding code pattern "01", "100", "1000", "10000", "100000", and an arbitrary one from "1000000", the data signal it is possible to adjust the end DSV at 250 or 251 when a selected modulation code ends with zero. 테이블 4의 5(B)에 있는 코드들의 반전 코드인 테이블 5의 5(C)에 있는 변조 코드 역시 테이블 B에 도시되어 있는 대로 바뀔수 있다. 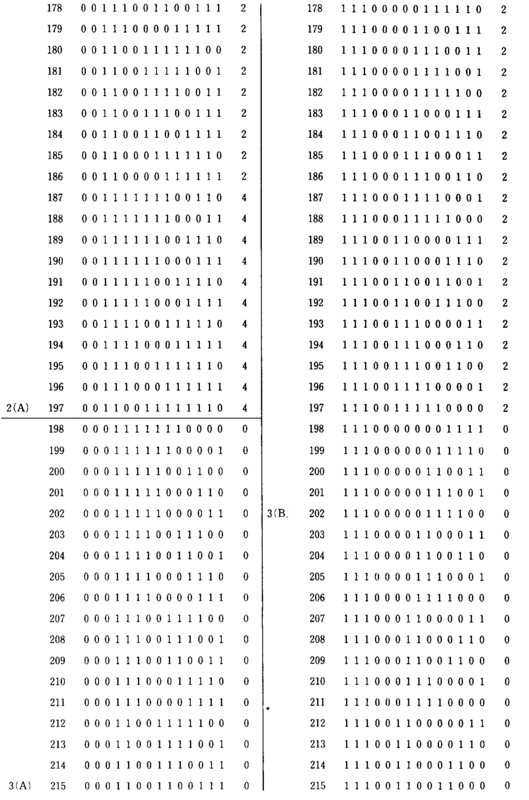 Modulation codes in 5 of the reverse code of Table 5 of the code (C) in 5 (B) of Table 4 can also be altered as shown in Table B. 테이블 4 및 12에 사용되지 않은 CDS=4인 변조 코드는 테이블 4, 또는 테이블 4 및 12에 있는 변조 코드대신 사용될 수 있다. 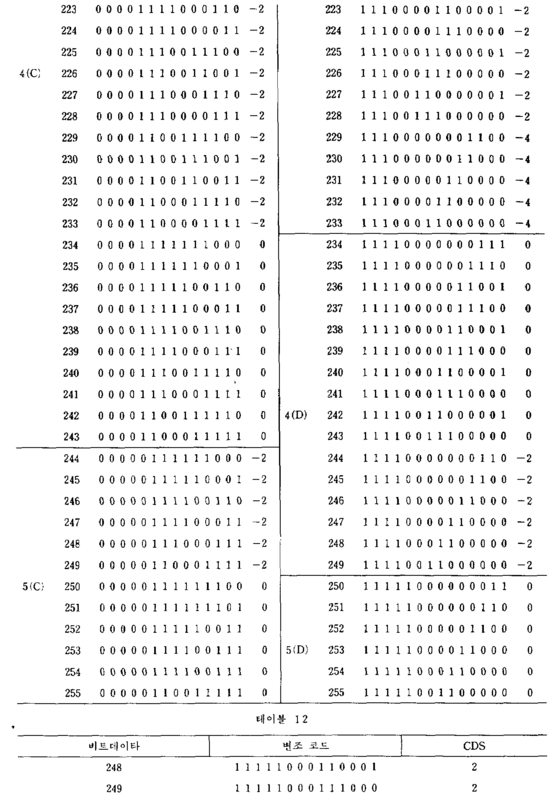 The modulation code which is not used for the table 4 and 12 CDS = 4 can be used in place of the modulation codes in Table 4 or Table 4, and 12. 선행 변조 코드의 단부에 있는 엔드 DSV가 -2일때 CDS=4인 변조 코드를 선택하면, 선택된 변조 코드에 있는 특정 비트에서 비트 DSV가 0을 확실히 취할 수 있기 때문에, 선택된 변조 코드의 비트 DSV가 향상된다. Because when the end DSV at the end of the preceding modulation code, a modulation code is -2 when the selected CDS = 4, the DSV bit in particular bit in the selected modulation code can certainly take 0, improve the bit DSV of the selected modulation code do. 테이블 4 및 12에 있는 코드의 반전 패턴인 테이블 5 및 13에 있는 변조 코드는 상기와 비슷한 식으로 바뀔 수 있어, 그 결과도 유사한 향상이 있게 된다. 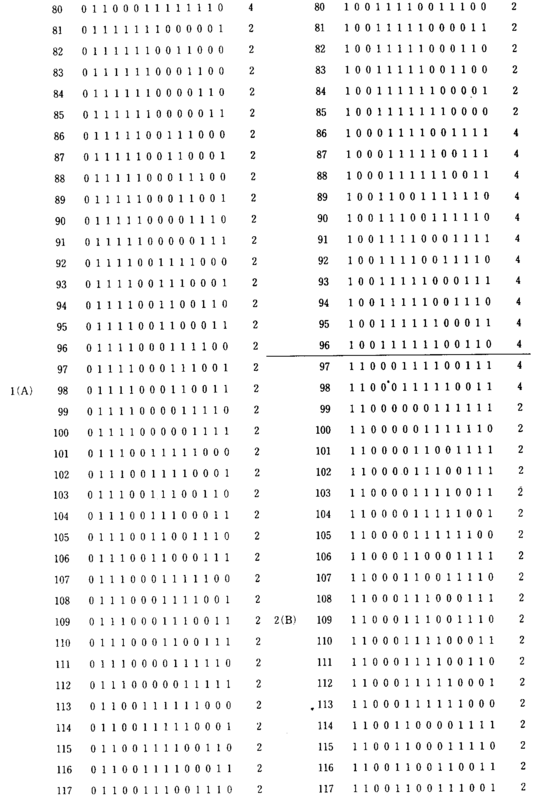 Modulation code in the code table 5 and the reverse pattern 13 of the in Table 4 and 12 can be changed in a similar way as the above, and as a result it is possible also a similar increase. 테이블 4 및 5에 있는 8비트 데이타에 대응하게 특정된 변조 코드는 한가지 예이다. 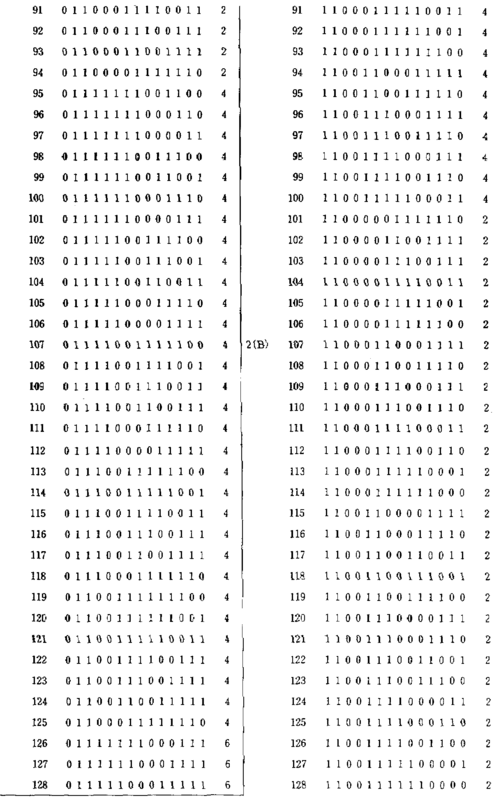 To correspond to 8-bit data in the tables 4 and 5, the particular modulation code is one example. 그러므로 변조 코드와 8비트 코드의 조합은 변경할 수 있다. Therefore the combination of the modulation codes and the 8-bit code can be changed. 선행 변조 코드의 엔드 패턴에 따라 나타나도록 되어 있는 변조 코드형 태들이 테이블 5에 도시되어 있다. 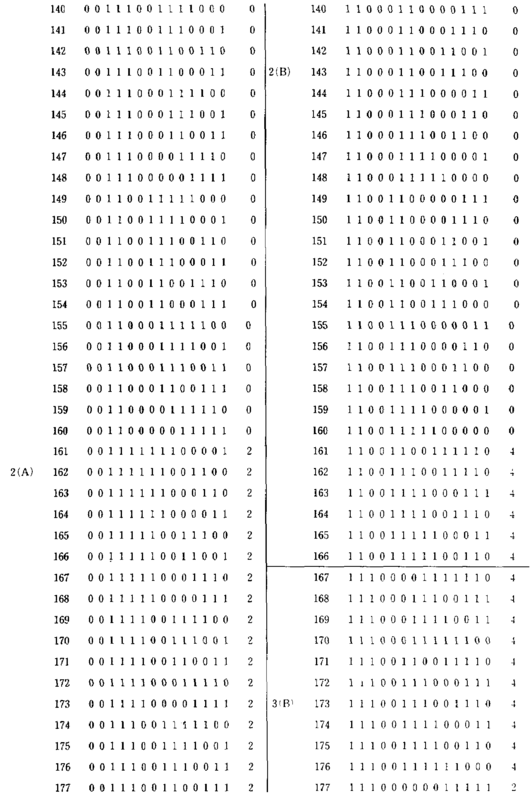 Is modulated coded tag that is to appear according to the end pattern of the preceding modulation code are shown in table 5. 0인 변조 코드가 선택됨을 가리킨다. 0 indicates that the modulation code is selected. 0이고 두 코드의 결합부에서 연속한 동일 비트수가 2-7이어야 하는 필요 조건을 만족해야만 하기 때문에 현행 변조 코드와 같이 나타날 수 있다. 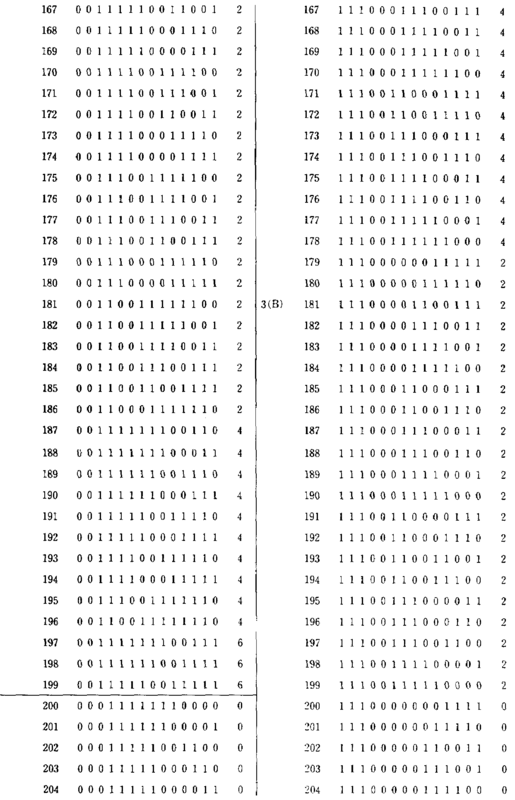 0, and it may appear as the current modulation code because the need to satisfy the requirement that the two codes be the same number of bits 2-7 in a continuous connecting portion of. 이 경우에, 현행 8-비트 데이타가 “166”이라고 가정하자. In this case, let's assume that the current 8-bit data is "166". 그러면, 테이블 4에 있는 두개의 가능한 변조 코드 “00111110011001”(CDS=2 ; 2(A)) 및 “11001111100110”(CDS=4, 2(B))가 선택된다 : 선행 변조 코드의 엔드 DSV와 현행 변조 코드의 CDS는 현행 변조 코드의 엔드 DSV를 얻기 위해 합쳐지고 : 보다 적은 엔드 DSV를 제공하는 변조 코드 즉 ”00111110011001”(CDS=2)가 선택된다. 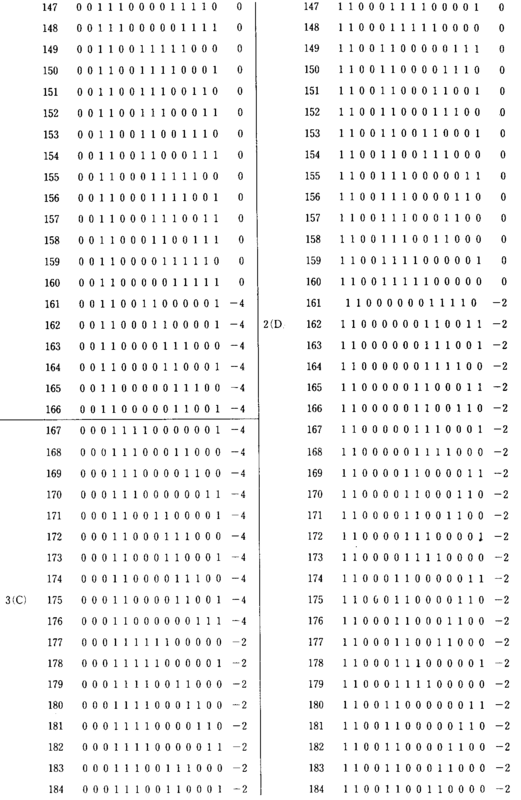 Then, the two possible modulation codes "00111110011001" (CDS = 2; 2 (A)) in the table 4, and "11001111100110" (CDS = 4, 2 (B)) is selected: the end DSV of the preceding modulation code and the current CDS of the modulation codes are combined to obtain the end DSV of the current modulation code: a modulation code that is "00111110011001" (CDS = 2) providing a small end DSV is selected more. 결과적인 엔드 DSV는 0이고 이는 직류 성분이 제거되었음을 가리킨다. The resulting end DSV is 0, which indicates that the DC component is removed. 제3a도는 자기테이상에 기록된 사인파가 재생될때의 CNR(캐리어 대 잡음비) 특성을 보여주고 있고, 제3b도는 랜덤 8비트 데이타가 변조기에 입력될때 변조기의 출력 단자에서의 전력 스펙트럼을 보여주고 있으며, 제3c도는 랜덤 8비트 데이타가 스크램블된 NRZ 변조기에 입력될때 스크램블된 NRZ 변조기의 출력 단자에서의 스크램블된 NRZ의 전력 스펙트럼을 보여주고 있다. No. 3a to turn and show the power spectrum at the output terminal of the modulator when the input to the modulator random 8-bit data, and shows the CNR (carrier-to-noise ratio) characteristics of when a sine wave recorded on the above magnetic Te reproduction, the 3b turns , the turning 3c shows the power spectrum of the scrambled NRZ at the output terminal of the scrambled NRZ modulator when the input to the NRZ modulator with a random 8-bit data scrambling. 이들 도면으로부터, 본 발명의 디지탈 변조 방법에 따라서 전력 스펙트럼은 직류 성분을 포함하지 않으며 높은 CNR이 얻어지는 기록-재생 대역폭내에 포함됨을 알수 있다. You can see the reproduced included in the bandwidth from these figures, according to the digital modulation method of the present invention the power spectrum does not include a DC component obtained by recording a high CNR. 결과적으로, 자기테이프와 헤드 시스템의 기록-재생 특성은 효율적으로 이용될 수 있다. As a result, writing of the magnetic tape and head system-reproducing characteristic it can be effectively used. 더구나, 본 발명에 따른 디지탈 변조 방법의 변조 코드의 최소 자화 전이폭은 스크램블된 NRZ의 최소 자화 전이폭의 1.14배이다. Also, the minimum magnetization transition width of the modulation codes of the digital modulation method according to the invention is 1.14 times the minimum magnetization transition width of the scrambled NRZ. 결과적으로 코드간 간섭이 감소된다. As a result inter-code interference to be reduced. 상술한 바와같이 상기 실시예는 변조 코드열에서 연속한 동일 비트의 수를 2-7로 제한하고 있다. The embodiment as described above, is limiting the number of consecutive identical bits in the modulation code sequence into 2-7. 결과적으로, 최소 자화 전이폭은 1.14T(=(2×8)/14)이다. A result, the minimum magnetization transition width is 1.14T (= (2 × 8) / 14). 여기서 T는 데이타의 주기이다. Where T is the period of the data. 최대 자화 전이폭은 4.00(=(7×8)T/14이고, DR은 1.14(=(2×8)/14)이고, 최대 자화 전이폭과 최소 자화 전이폭의 비는 3.5이다. 따라서, 자기 기록의 비트 에러율이 감소 되고, 고밀도 기록이 가능해진다. 또한, 애지무스 기록 및 고질 오버 기록도 가능해진다. And T / 14 maximum magnetization transition width is 4.00 (= (7 × 8), the DR is 1.14 (= (2 × 8) / 14) and the maximum magnetization ratio of the transition width to the minimum magnetization transition width is 3.5. Thus, the bit error rate of the magnetic recording is reduced, and a high-density recording becomes possible. Further, it is also possible who asked mousse recording and chronic over-written. 또한, 상기 실시예는 변조 코드의 CDS의 절대값을 4 또는 그 이하로 제한하고, 선행 변조 코드의 단부에 있는 DSV와 선행 코드의 엔드 패턴에 따라 각각의 8비트 데이타에 4개 까지의 변조 코드를 할당하여, 최소 절대값을 제공하는 엔드 DSV를 갖는 변조 코드를 선택한다. In addition, the embodiment is an absolute value of CDS of the modulation code of 4 or limited to below, each of the modulation codes of up to four 8-bit data in accordance with the end pattern of the DSV and the preceding code at the end of the preceding modulation code the assignment, selects the modulation code the end DSV has provided the lowest absolute value. 결과적으로, 각각의 변조 코드의 단부에서 계산되는 엔드 DSV의 절대값은 2이내이며, 변조 코드의 각각의 비트에서 계산되는 비트 DSV의 절대값은 7이내이다. As a result, the absolute value of the end DSV is less than 2, which is calculated at the end of each modulation code, the absolute value of the bit DSV which is calculated at each bit of the modulation code is within 7. 그래서, 직류 성분은 효율적으로 제거되며, 그러므로 변조 코드의 전송은 직류 성분을 통과 시키지 않는 로터리 변환기를 이용하므로써 가능해진다. Thus, the DC component is effectively removed, and therefore the transmission of the modulation codes becomes possible By using a rotary transformer that does not pass the direct current component. 제6도는 본 발명의 디지탈 변조 방법의 제 2 실시예에 따라 디지탈 변조를 실행하기 위한 디지탈 변조 장치를 보여주는 블록 다이어그램이다. Claim 6 is a turning block diagram showing a digital modulation apparatus for carrying out the digital modulation according to the second embodiment of the digital modulation method of the present invention. 제6도에서, 8비트 디지탈 데이타(1)는 엔코더(2)에 의해 14비트 디지탈 변조 코드로 변환된다. 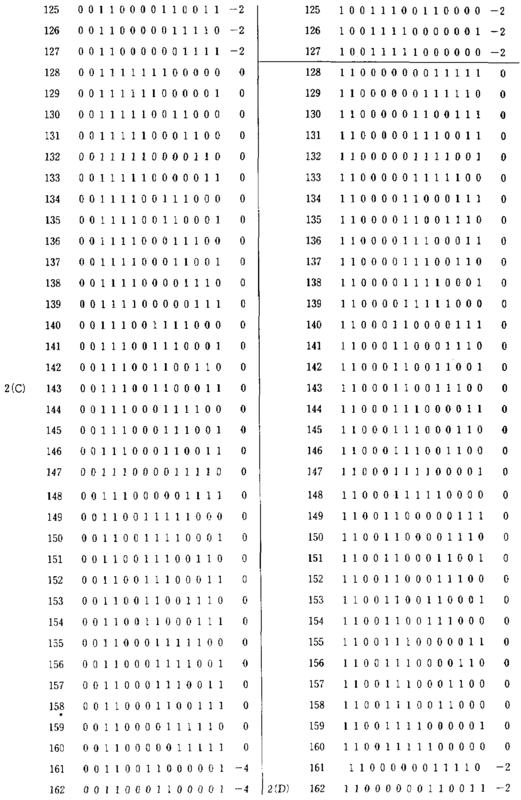 In Figure 6, the 8-bit digital data 1 is converted into 14-bit digital modulation code by an encoder (2). 엔드 패턴 판단부(3)는 14비트 디지탈 변조 코드의 마지막 5비트의 엔드 패턴을 테이블 21에 있는 4비트 코드로 변환시킨다(변조 코드의 마지막 7비트가 테이블(21)에 주어져 있을지라도, 단지 마지막 5비트만이 고려되고 있다). 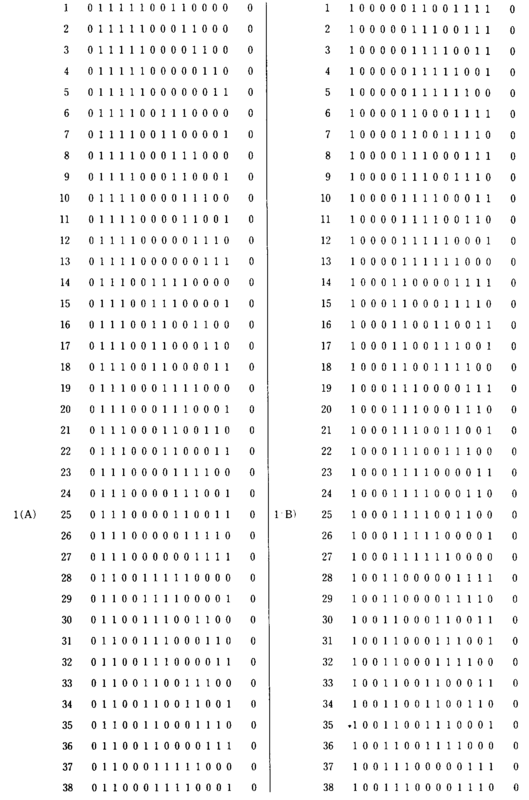 End pattern judgment portion 3 even if the last 7 bits of the causes (modulation code converts the end pattern of the last 5 bits of 14-bit digital modulation code into a 4-bit code in Table 21 are given in table 21, only the last 5 bits only is considered). CDS계산부(5)는 공급된 14비트 디지탈 변조 코드의 CDS를 계산하고, 그 결과의 CDS를 테이블 20에 있는 3비트 코드로 변환시킨다. CDS calculation portion 5 computes the CDS of the 14-bit digital modulation code supplied, and converts the resultant CDS into a 3-bit code in Table 20. DSV 계산부(4)는 현행 14비트 디지탈 변조 코드의 CDS를 선행 14비트 디지탈 변조 코드의 단부에 있는 DSV에 가산시켜 새로운 DSV를 산출해내고, 이 뉴 DSV를 테이블 20에 있는 3비트 코드로 변환시킨다. 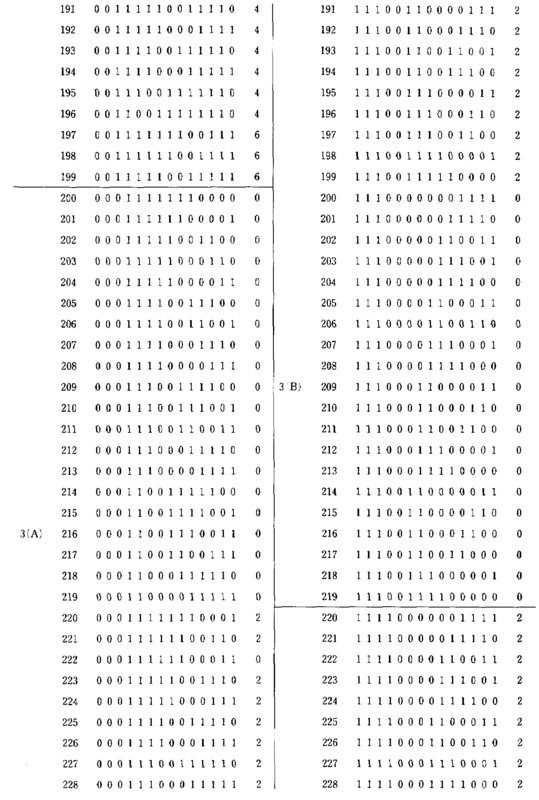 Out to DSV calculation portion 4 was added to the DSV at the end of the current 14-bit digital modulation code CDS preceding 14-bit digital modulation code of calculating a new DSV, converts the new DSV into a 3-bit code in Table 20 thereby. 병렬-직렬 변환기(8)는 14비트 디지탈 변조 코드를 클럭 신호 9와 동기되어 직렬 신호로 변환시킨다. Parallel-to-serial converter (8) is a synchronous 14-bit digital modulation code and the clock signal 9 is converted to a serial signal. 기록부(10)는 병렬-직렬 변환기(8)로부터 생성된 직렬 변조 신호를 자기테이프 등과 같은 기록 매체에 기록한다. Recording unit 10 is a parallel-records the serial modulation signal produced from the serial converter 8 on a recording medium such as a magnetic tape. 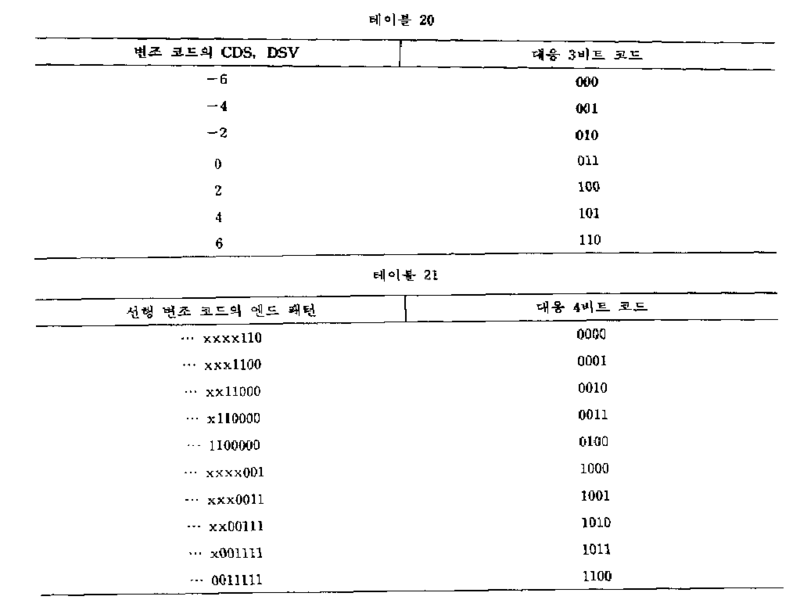 CDS 계산부(5)에 의해 테이블 20에 있는 3비트 코드로 변환된 도출된 CDS는 DSV 계산부(4)에 공급된다. CDS calculation portion 5 is converted to the 3-bit code in the table 20, derived by the CDS is supplied to the DSV calculation portion (4). DSV 계산부(4)는 도출된 DSV를 테이블 20에 있는 3비트 코드로 변환시켜 이 코드를 래치(6)를 통해 엔코더(2)에 공급한다. 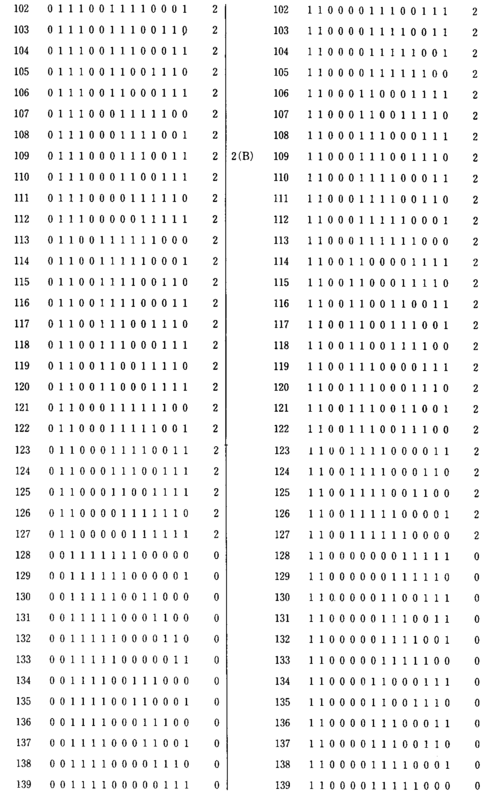 DSV calculation portion 4 supplies the DSV obtained in the encoder 2 converts the code into a 3-bit code in the table 20 through the latch (6). 엔드 패턴 판단부(3)는 마지막 5비트를 테이블 21에 있는 4비트 코드로 변환시켜, 이 코드를 래치(7)를 통해 엔코더(2)에 공급한다. 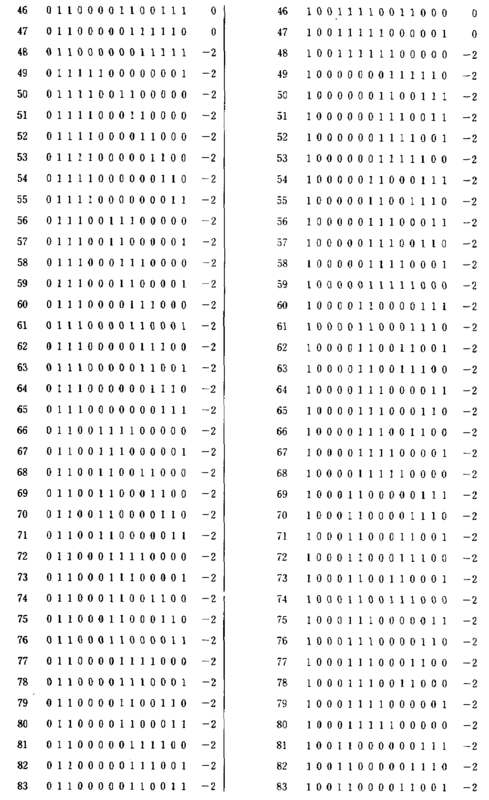 End pattern judgment portion 3 converts the last five bits into a 4-bit code in the table 21, and supplies the code to the encoder 2 via a latch (7). 다음에는 각각의 입력된 8비트 디지탈 데이타에 대응하는 14비트 디지탈 변조 코드를 선택하는 방법이 설명된다. 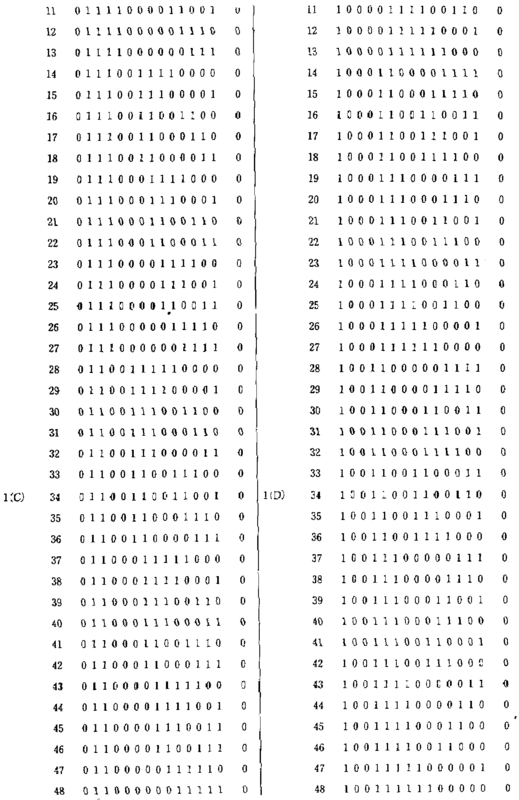 Next, a method for selecting a 14-bit digital modulation code corresponding to each inputted 8-bit digital data is described. 먼저, 각각의 8비트 디지탈 데이타에 대해 14비트 디지탈 변조 코드를 4개까지 선택하는 방법이 설명된다. 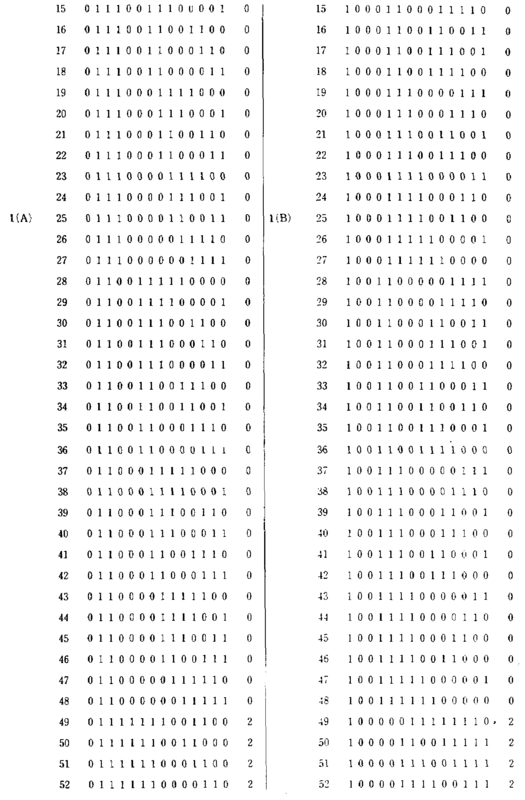 First, the method for selecting up to four 14-bit digital modulation code is described for each of the 8-bit digital data. 14비트 디지탈 변조 코드는, (a) 2 14 14비트 디지탈 코드중에서, 연속한 동일 비트수가 제1의 7비트에서 6 또는 그 이하이고 제 2 비트에서 제13비트까지는 2-7이고, 마지막 6비트에서는 5 또는 그 이하인 디지탈 코드를 선택하고, 이러한 선택 절차를 반복하는 절차, (b) 절차(a)에서 선택된 14비트 디지탈 코드중에서, 제1비트가 “0”이고, CDS의 절대값이 6 또는 그 이하인 디지탈 코드를 선택하고, 이러한 선택 절차를 반복하는 절차, (c) 절차(a)에서 선택된 14비트 디지탈 코드 중에서, CDS의 절대값이 4 또는 그 이하인 디지탈 코드를 선택하고, 선택하고, 이러한 선택 절차를 반복하는 절차, (d) 절차(b)에서 선택된 14비트 디지탈 코드중에서, CDS값이 0인 디지탈 코드를 선택하고, 2디지탈 코드를 한 그룹으로 만들기 위하여 선택된 14비트 디지탈 코드와 그의 반전 코 14-bit digital modulation code is, (a) 2 14 14 bits of digital code, the number of continuous identical bits from a second bit 7 6 or less of claim 1 and 2-7 in the second bit by the 13th bit, and the last 6 bits the 5 or selecting the more than the digital code, and in this selection procedure, the procedure, (b) steps (a) 14-bit digital codes selected from the repeating, the first bit is "0", the absolute value of the CDS 6 or that not more than select the digital code and, in this selection procedure, the procedure, (c) process the 14-bit digital codes selected in (a) of repeating, when the absolute value of the CDS is selected, the four or less digital codes, and selecting, and this steps of repeating the selecting procedure, (d) from the process (b) a 14-bit digital codes selected from, CDS value is zero, the selected digital codes, and the 14-bit digital codes and their inverting selected to make the 2 digital codes one group, nose 를 쌍으로 하고, 이러한 선택 절차를 반복하는 절차, (e) 절차(b)에서 선택된 14비트 디지탈 코드중에서, CDS의 값이 +2, +4 또는 +6인 디지탈 코드를 선택하고, 절차(c)에서 선택된 14비트 디지탈 코드중에서 CDS의 값이 +2 또는 +4인 디지탈 코드를 선택하고, 4디지탈 코드를 한 그룹으로 만들기 위해 두개의 선택된 14비트 디지탈 코드와 그의 반전 코드를 결합하고, 이러한 선택 절차를 반복하는 절차, (f) 14비트 디지탈 변조 코드로서 상기 절차에서 형성된 그룹들중에서 256그룹을 선택하는 절차에 의해 선택된다. 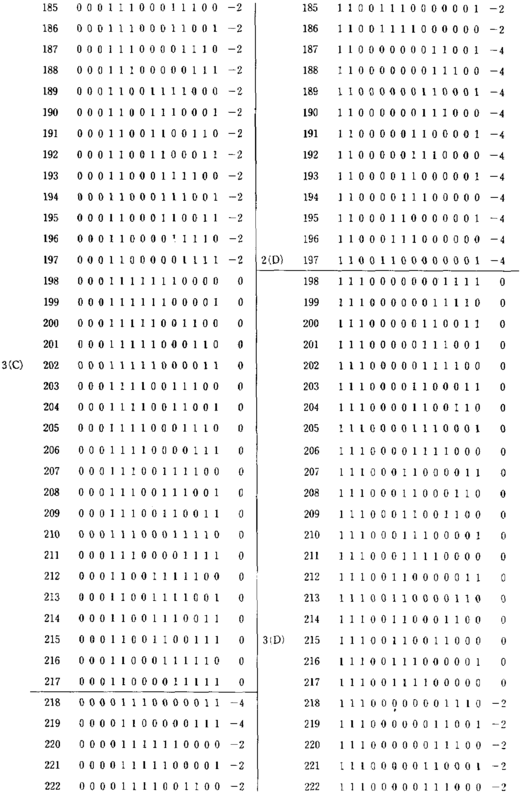 As a pair, and procedure for repeating this selecting procedure, (e) the procedure of 14-bit digital codes selected in (b), select the value of the CDS +2, +4 or +6 digital code, and the procedure (c ) to select the value of CDS of +2 or +4 digital code from the selected 14-bit digital code, and four coupling the two selected 14-bit digital code and its inverted code to create the digital codes one group, and this selection the procedure for repeating the procedure, (f) is selected by the steps of selecting 256 groups among the groups formed in the above procedures as the 14-bit digital modulation code. 다음에는, 입력된 8비트 데이타에 대응하는 14비트 디지탈 변조 코드(현행 변조 코드)의 선택 절차가 제 7도를 참조로 설명한다. Next, it will be described as the selection process of the 14-bit digital modulation code corresponding to the inputted 8-bit data (current modulation code) Referring to a seventh FIG. 이 도면은 본 발명의 디지탈 변조 방법에 따른 변조 절차를 보여주는 흐름도이다. This figure is a flow chart showing the modulation procedure according to the digital modulation method of the present invention. 단계 S1에서는 선행 변조 코드의 단부에 있는 DSV가 계산된다. In step S1, the DSV at the end of the preceding modulation code is calculated. 단계 S2에서는 선행 변조 코드의 엔드 패턴이 판단된다. In step S2, the end pattern of the preceding modulation code is judged. 스텝 S3에서는, DSV<0일때는 테이블 17에 있는 변조 코드가 선택되고, DSV>0일때는 테이블(18)에 있는 변조 코드가 선택된다. 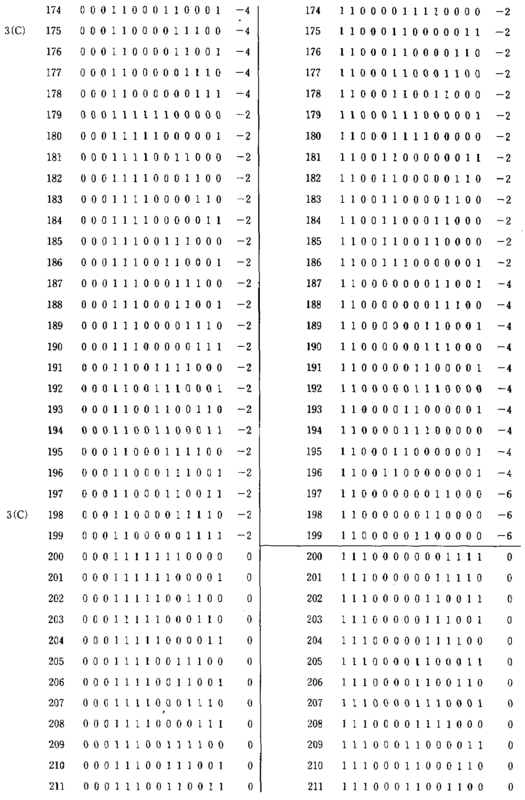 In step S3, DSV <0 when the modulation codes in Table 17 are selected, DSV> 0 when the modulation codes in Table 18 are selected. 한편 DSV=0이고 선행 코드의 엔드 패턴이 “… The DSV = 0 and the end pattern of the preceding code "... 110”, “… 110 "," ... 0011”, “… 0011 "," ... 00111”, “… 00111 "," ... 001111” 및 “… 001111 "and" ... 011111”중 임의 하나일때는 테이블 18에 있는 변조 코드가 선택된다. 011 111 "when any one of the modulation codes in Table 18 are selected. 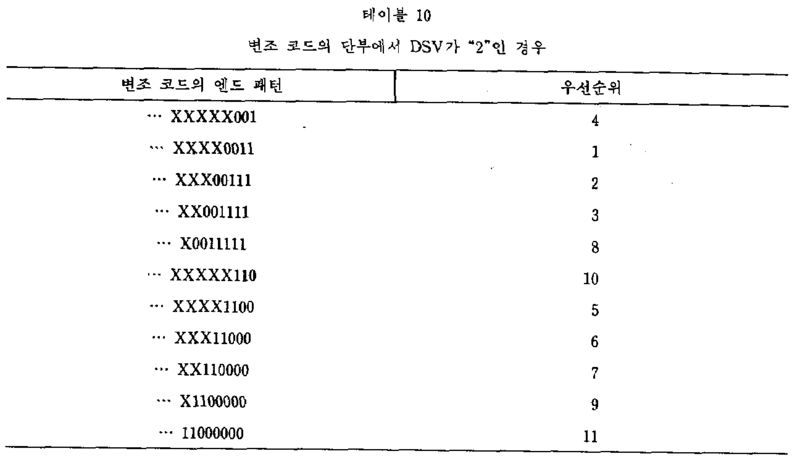 더우기, DSV=0이고 선행 코드의 엔드 패턴이 “… In addition, DSV = 0 and the end pattern of the preceding code "... 1100”, “… 1100 "," ... 11000”, “… 11000 "," ... 110000”, “… 110000 "," ... 1100000”및 “… 1,100,000 "and" ... 001”중 임의 하나일때는 테이블 17에 있는 변조 코드가 선택된다. 001 "when any one of the modulation codes in Table 17 are selected. 단계 S4에서는, 변조 코드가 선행 변조 코드의 엔드 패턴에 따라서 단계 S3에서 선택된 코드중에서 그리고 테이블 17 및 18에 클라스 1(A)-6(D)중에서 선택된다. In step S4, a modulation code is selected from the classes 1 (A) -6 (D) from the selected code table, and 17 and 18 at step S3 in accordance with the end pattern of the preceding modulation code. 스텝 S5에서, 2개 이상의 변조 코드가 단계 S4에서 선택될때 절대값이 최소인 DSV를 제공하는 변조 코드가 선택된다. In step S5, when selecting at least two modulation codes the step S4 is a modulation code that provides a minimum absolute value of DSV is selected. 이 경우에, DSV는 선행 변조 코드의 단부에 있는 DSV와 현행 변조 코드의 CDS를 합하므로써 얻어진다. In this case, DSV is obtained By summing the CDS of the current modulation code DSV and at the end of the preceding modulation code. 단계 S6에서, 다음의 필요 조건을 만족하는 변조 코드는 단계 S6에서 선택된 2개 이상의 변조 코드가 동일한 최소 DSV를 가질때 선택된다. In step S6, a modulation code that satisfies the following requirement of the two or more modulation codes selected at step S6 it is selected gajilttae the same minimum DSV. 선행 변조 코드의 단부에서 DSV<0일때, 제1비트가 “1”인 변조 코드가 선택된다. Is a modulation code is selected DSV <0 when at the end of the preceding modulation code, the first bit is "1". 선행 변조 코드의 단부에서 DSV>0일때, 제1비트가 “0”인 변조 코드가 선택된다. Is a modulation code is selected at the end of the preceding modulation code DSV> 0 when the first bit is "0". 선행 변조 코드의 단부에서 DSV=0일때, 제1비트가 선행 변조 코드의 마지막 비트와 반대인 변조 코드가 선택된다. Is DSV = 0 when the first bit is the last bit of the preceding modulation code and opposite to the modulation code is selected at the end of the preceding modulation code. 그렇게 선택된 14비트 디지탈 변조 코드는 병렬-직렬 변환기(8)에 공급된다. So 14-bit digital modulation code is selected, the parallel-serial converter is supplied to the (8). 병렬-직렬 변환기(8)에 공급된 변조코드는 클럭(9)와 동기되어 직렬로 판독되어 기록부(19)에 공급된다. Parallel-modulated code supplied to serial converter (8) is synchronized with the clock (9) is read out in series it is supplied to the recording unit (19). 여기서 14비트 디지탈 변조 코드는 지기테이프 등과 같은 기록매체에 기록된다. The 14-bit digital modulation code is recorded in a recording medium such as a tape being. 한편, 엔코더(2)에 의해 선택된 14비트 디지탈 변조코드는 DSV 계산부(4) 및 변조 코드 엔드 패턴 판단부(3)에 공급된다. On the other hand, 14-bit digital modulation code selected by the encoder 2 is supplied to the DSV calculation portion 4, and the modulation code end pattern judgment portion 3. DSV 계산부(4)는 새로운 DSV를 얻기 위해서 형해 변조 코드의 CDS를 선행 변조 코드의 단부에 있는 DSV에 가산한다. DSV calculation portion 4 adds the CDS of the modulation code carcase in order to obtain a new DSV in DSV at the end of the preceding modulation code. 상기 새로운 DSV는 테이블 20에 따라 3비트 코드로 변환되어 래치(6)를 통해 엔코더(2)에 공급된다. 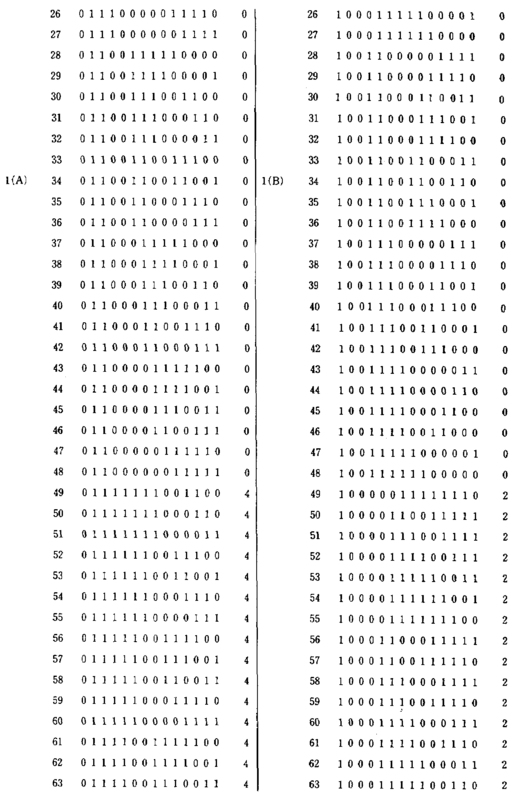 The new DSV is converted into a 3-bit code according to Table 20 is supplied to the encoder 2 via a latch (6). 엔드 패턴 판단부(3)는 테이블 21에 따라서 14비트 변조 코드의 마지막 6비트를 4비트 코드로 변환시켜, 이 4비트 코드를 래치(7)를 통해 엔코더(2)에 공급한다. 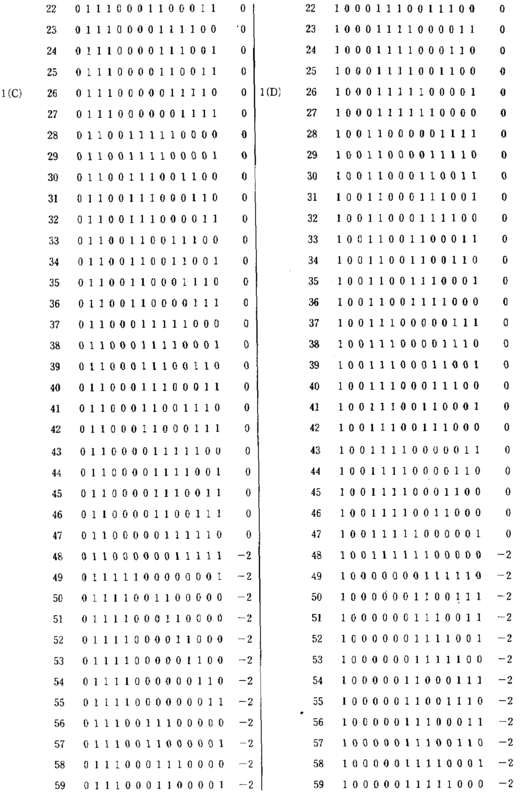 End pattern judgment portion 3 converts the last 6 bits of the 14-bit modulation code according to Table 21 in 4-bit code, and supplies the 4-bit code to the encoder 2 via a latch (7). 상기 절차는 모든 8비트 입력 데이타에 대해서 반복된다. The procedure is repeated for every 8-bit input data. 그래서, 14비트 디지탈 변조 코드 열이 얻어지는데, 이 코드 열에서 연속한 동일 비트수는 2-7로 제한되고, DSV의 절대값은 8 또는 그 이하로 제한된다. 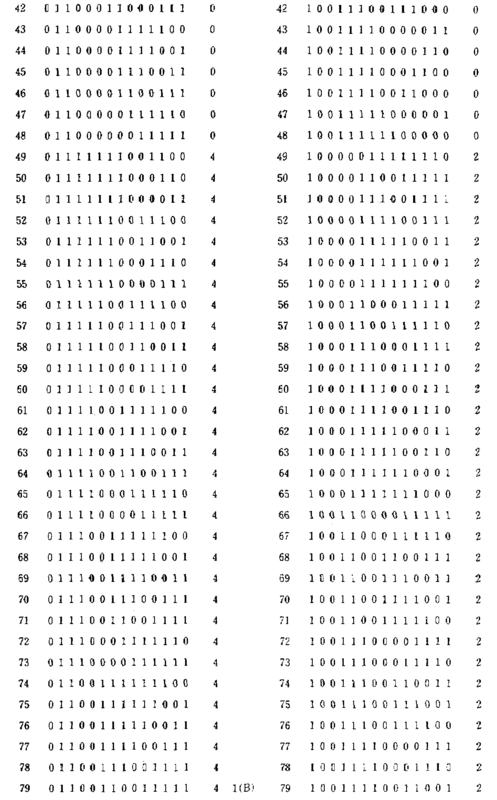 Thus, is obtained a 14-bit digital modulation code sequence, the number of consecutive identical bits in the code string is limited to 2-7, the absolute value of the DSV is restricted to eight or less. 다음에는 제6도에 있는 엔코더(2)로부터 생성된 14비트 디지탈 코드에 대해 설명된다. 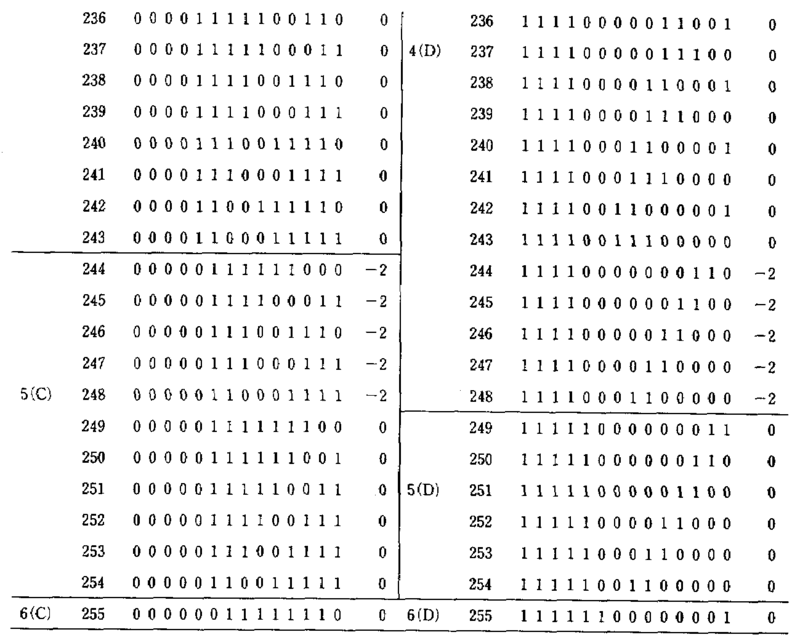 Next, it will be described for a 14-bit digital code produced from the encoder 2 in Figure 6. 8비트 코드로부터 변환된 14비트 디지탈 변조 코드는 다음의 필요 조건을 만족한다. 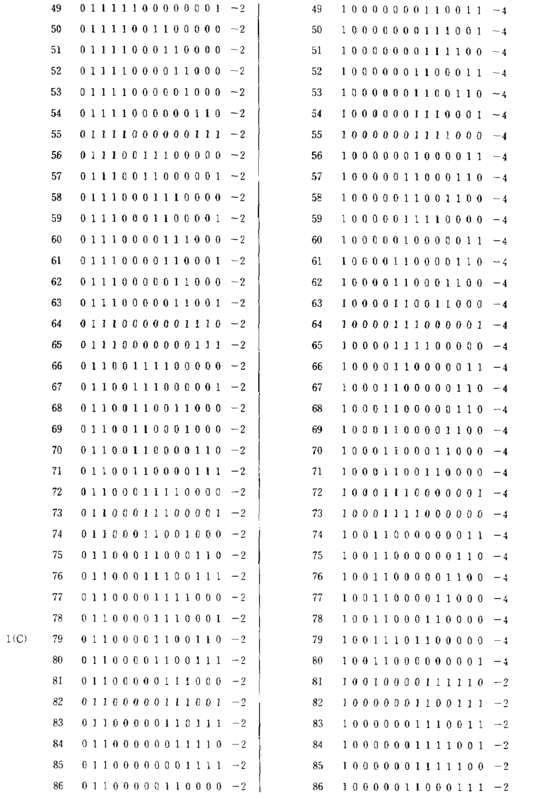 The 14-bit digital modulation code converted from the 8-bit code satisfies the following requirement. (1) 제1의 7비트에 있는 연속한 동일 비트수는 7 또는 그 이하이다. (1) The number of consecutive identical bits in the bit 7 of the first is 7 or less. (3) 마지막 6비트에 포함되어 있는 연속한 동일 비트수는 5 또는 그 이하이다. (3) The number of consecutive identical bits included in the last 6 bits is five or less. (4) 변조 코드의 CDS의 절대값은 6 또는 그 이하이다. (4) the absolute value of CDS of the modulation code is 6 or less. 상기 필요 조건(1) 내지 (4)를 만족하는 변조 코드의 엔드 패턴은 다음의 10개 아이템(A)-(K)로 요약 된다. The required end patterns of the modulation codes that satisfy the conditions (1) to (4) are: 10 items (A) of - is summarized as (K). 변조 코드 (A)-(K)에 이어지는 코드의 시작은 다음의 아이템중 하나이다. Modulation codes (A) - leading to the start of the code (K) is one of the following items. 먼저 변조 코드(A)에 이어지는 변조 코드의 시작은 다음의 5개 아이템(A1)-(A-6)중 하나이다. First the beginning of the modulation code following the modulation code (A) has the following five items (A1) - one (A-6). 둘째로, 변조 코드(B)에 이어지는 변조 코드의 시작은 다음의 10개 아이템(B1)-(B10)중 하나이다. Second, the beginning of the modulation code following the modulation code (B) is the following ten items (B1) - one (B10). 변조 코드(C)에 이어지는 변조 코드의 시작은 다음의 9개 아이템(C1)-(C9)중 하나이다. Start of a modulation code following the modulation code (C) has the following nine items (C1) - one (C9). 변조 코드(D)에 이어지는 변조 코드의 시작은 다음의 8개 아이템(D1)-(D8)중 하나이다. Start of a modulation code following the modulation code (D) is of the following eight items (D1) - one (D8). 변조 코드(E)에 이어지는 변조 코드의 시작은 다음의 7개 아이템(E1)-(E7)중 하나이다. The beginning of the modulation code following the code modulation (E) has seven items (E1) of the following: - one (E7). 변조 코드(F)에 이어지는 변조 코드의 시작은 변조 코드(A1)-(A6)의 반전 패턴중 하나이다. Start of a modulation code following the modulation code (F) is a modulation codes (A1) - is one of the reversal patterns of (A6). 변조 코드(G)에 이어지는 변조 코드의 시작은 변조 코드(B1)-(B10)의 반전 패턴중 하나이다. Start of a modulation code following the modulation code (G) is a modulation codes (B1) - is one of the reversal patterns of (B10). 변조 코드(H)에 이어지는 변조 코드의 시작은 변조 코드(C1)-(C9)의 반전 패턴중 하나이다. Start of a modulation code following the modulation code (H) is a modulation codes (C1) - is one of the reversal patterns of the (C9). 변조 코드(J)에 이어지는 변조 코드의 시작은 변조 코드(D1)-(D7)의 반전 패턴중 하나이다. Start of a modulation code following the modulation code (J) is the modulation codes (D1) - is one of the reversal patterns of (D7). 변조 코드(K)에 이어지는 변조 코드의 시작은 변조 코드(E1)-(E7)의 반전 패턴중 하나이다. Start of a modulation code following the modulation code (K) is the modulation codes (E1) - is one of the reversal patterns of (E7). 필요 조건(1)-(4)를 만족하는 변조 코드의 수는 테이블 14 및 15에 도시되어 있다. 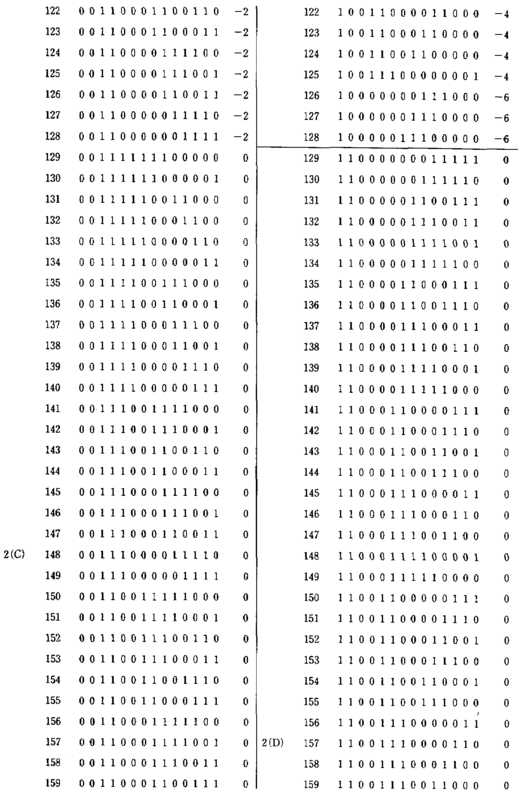 Requirement (1) The number of modulation codes that satisfy (4) is shown in table 14 and 15. 0인 256개 이상의 변조 코드가 필요한데, 이는 변조 코드(A)-(K)중 하나를 따른다. 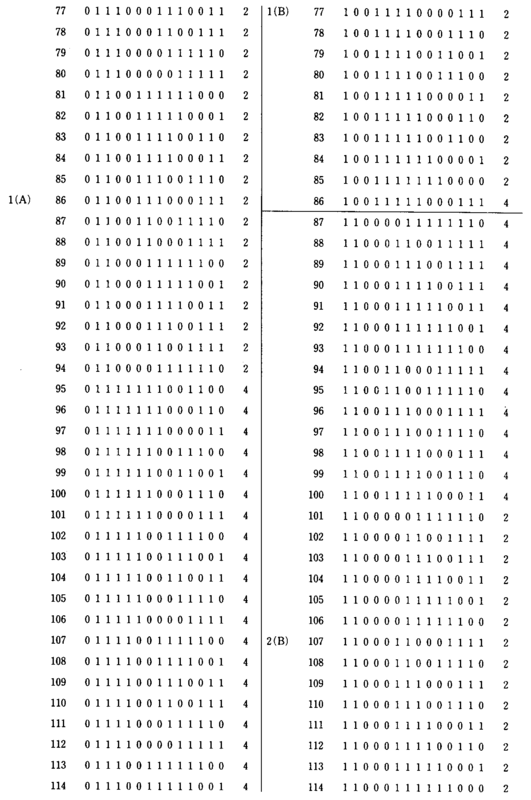 The need of more than 256 0 code modulation, which modulation codes (A) - follows one of (K). 또한, 변환된 변조 코드는 전송 에러를 피하기 위해 하나의 8비트 데이타에 대응해야만 한다. In addition, the converted modulation code must correspond to one 8-bit data to avoid transmission error. 변조 코드(A)-(K)중 하나에 계속될 수 있는 변조 코드의 수는 테이블 16에 표시되어 있다. 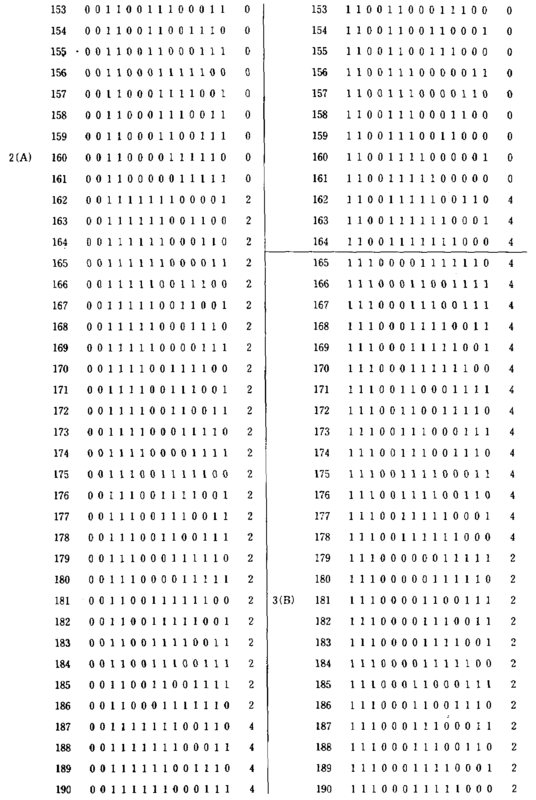 Modulation codes (A) - The number of modulation codes that can be continued for one of the (K) is shown in table 16. 0일때의 각각의 클라스의 변조 코드수를 보여주고 있다. It shows the number of modulation code of respective classes when 0. 테이블 17 및 18은 8비트 데이타와 변조 코드 사이의 대응 관계를 보여주는데, 테이블 17은 CDS≥0일때의 대응 관계를 보여주고, 제18도는 CDS≤0일때의 대응 관계를 보여주고 있다. 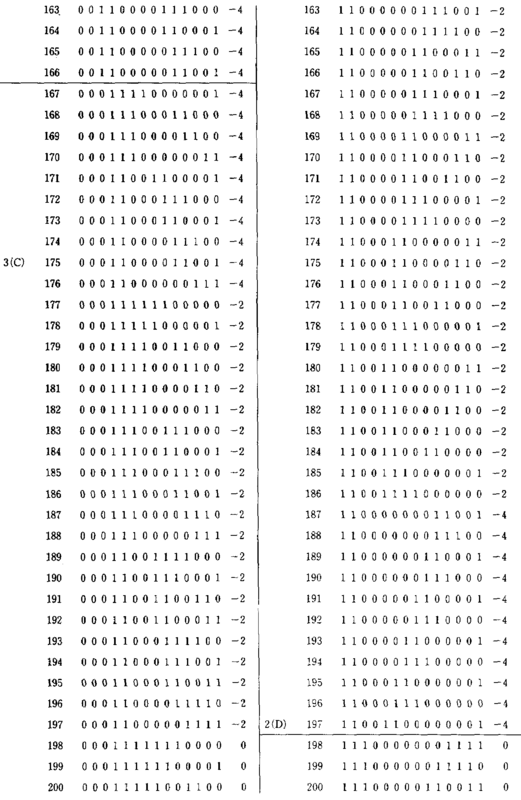 Tables 17 and 18 to show the correspondence between the 8-bit data and the modulated code, Table 17 shows the correspondence between the CDS≥0 when, showing the correspondence between the 18 degrees when CDS≤0. 선형 변조 코드의 엔드 패턴에 따라서 나타날 수 있는 변조 코드 형태는 테이블 19에 표시되어 있다. 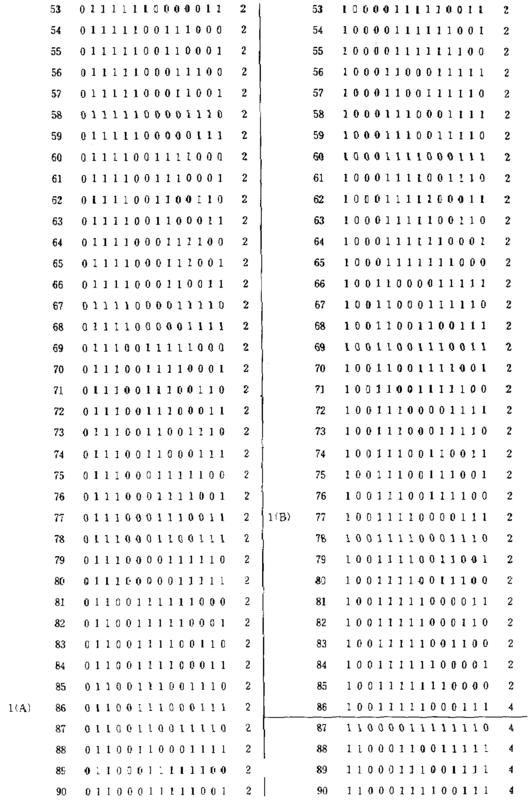 Modulation code form that can appear according to the end pattern of the linear modulation code is shown in table 19. “0”마크는 변조 코드가 허용되는 것을 가리킨다. "0" mark indicates that the modulation code allowed. 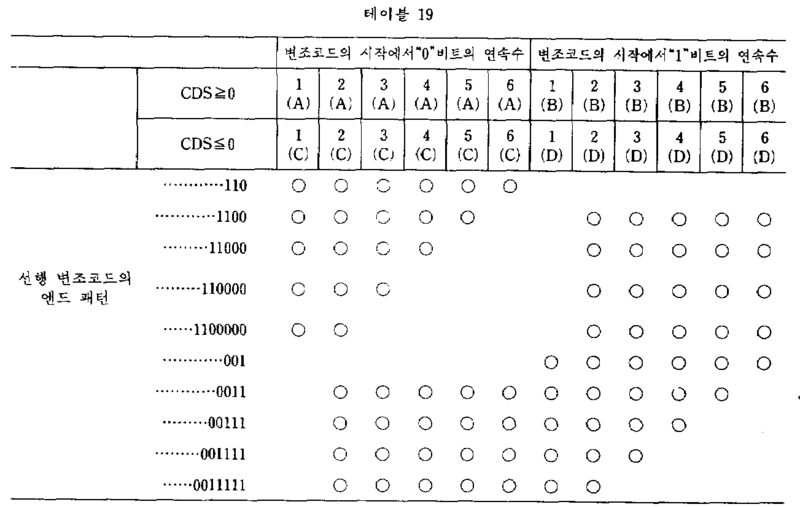 예로, 선행 변조 코드의 엔드 패턴이 “… For example, the end pattern of the preceding modulation code "... 11000”이고 선행 변조 코드의 엔드 DSV가 -4일때, 테이블 17에 있는 클라스 1(A), 2(A), 3(A), 4(A), 2(B), 3(B), 4(B), 5(B) 및 6(B)의 변조 코드는 현행 변조 코드와 같이 나타날 수 있다. 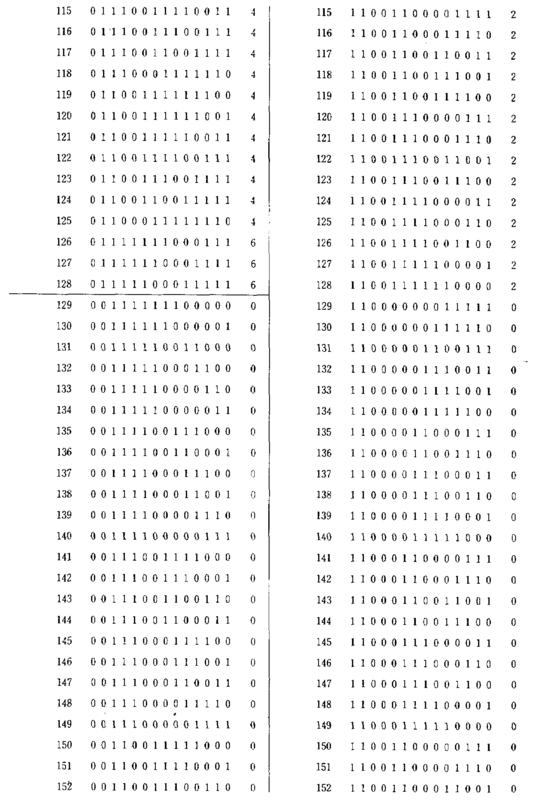 11000 ", and when the end DSV of the preceding modulation code is -4, classes in the table 17 1 (A), 2 (A), 3 (A), 4 (A), 2 (B), 3 (B), 4 modulation code (B), 5 (B) and 6 (B) can appear, such as the current modulation code. 이 경우에, 현행 8비트 데이타가 “166”이라고 가정하자. In this case, let's assume that the current 8-bit data is "166". 그러면, 두개의 가능한 변조 코드 “00111110011100”(CDS=2 ; 2(A)), 및 “11100011001111”(CDS=4, 2(B)중 하나가 선택된다 : 선행 변조 코드의 단부에 있는 엔드 DSV와 현행 변조 코드의 CDS는 현행 변조 코드의 단부에 있는 엔드 DSV를 얻기 위해 합쳐지고 ; 더 적은 작은 DSV를 주는 변조 코드 즉 “11100011001111”(CDS=4)가 선택된다. 도출된 DSV는 0이고 이는 직류 성분이 제거되었음을 가리킨다. Then, the two possible modulation codes "00111110011100" (CDS = 2; 2 (A)) one, and "11100011001111" (CDS = 4, 2 (B) is selected: the end DSV at the end of the preceding modulation code CDS of the current modulation code are combined to obtain the end DSV at the end of the current modulation code; the modulation code, namely "11100011001111" (CDS = 4) to the small DSV less is selected derived DSV is 0 and it direct current It indicates that the component is removed. 제3a도는 자기테이프상에 기록된 사인파가 재생될때의 CNR의 특성을 보여주고, 제3b도는 랜덤한 8비트 데이타가 변조기에 입력될때 변조기의 출력 단자에서의 전력 스펙트럼을 보여주며, 제3c도는 랜덤한 8비트 데이타가 스크램블된 NRZ 변조기에 입력될때 스크램블된 NRZ 변조기의 출력 단자에서의 스크램블된 NRZ의 전력 스펙트럼을 보여준다. No. 3a to turn shows the power spectrum at the output terminal of when random 8-bit data is input to a modulator modulator shows the CNR characteristics of a when the sine wave is reproduced recorded on the magnetic tape, the 3b to turn, the 3c turn random when the input NRZ modulator of one 8-bit data is scrambled shows the power spectrum of the scrambled NRZ at the output terminal of the scrambled NRZ modulator. 상술한 바와 같이, 상기 실시예는 변조 코드열로된 연속한 동일 비트수를 2-7로 제한하고 있다. The embodiment as described above, is limiting the number of the same bits of the modulation code sequence into a continuous 2-7. 결과적으로, 최소 자화 전이폭은 1.14T(=(2×8)T/14, 여기서 T는 8비트 데이타의 비트 주기임)이고, 최대 자화 전이폭은 4.00T(=(7×8)T/14)이고, DR은 1.14(=(2×8)/14)이고, 최대 자화 전이폭과 최소 자화 전이폭의 비는 3.5이다. As a result, the minimum magnetization transition width is 1.14T (= (2 × 8) T / 14, where T is the bit period being a 8-bit data) and the maximum magnetization transition width is 4.00T (= (7 × 8) T / 14), and the DR is 1.14 (= (2 × 8) / 14) and the maximum magnetization transition width to the minimum magnetization transition width ratio of 3.5. 결과적으로, 자기 기록의 비트 에러율은 감소되고 고밀도 기록이 가능해진다. As a result, the bit error rate of the magnetic recording is reduced and the high-density recording becomes possible. 또한 애지 무스 기록 및 고밀도 오버 기록도 가능해진다. In addition, it is also possible who asked mousse recording and high density recording over. 더구나, 상기 실시예는 변조 코드의 CDS의 절대값을 4이하로 제한하고, 선형 변조 코드의 단부에 있는 DSV와 선행 코드의 엔드 패턴에 따라 각각의 8비트 데이타에 변조 코드를 4개까지 할당하며, 최소의 절대값을 주는 DSV를 갖고 있는 변조 코드를 선택한다. Furthermore, the embodiment restricts the absolute value of CDS of the modulation code by 4 or less, and assign up to 4 modulation codes to each 8-bit data in accordance with the end pattern of the DSV and the preceding code in the end portion of the linear modulation code, , and selects the modulation code that has the lowest absolute value of DSV to give. 결과적으로, 엔드 DSV의 최대 절대값은 4이내로 제한된다. As a result, the maximum absolute value of the end DSV is limited to four. 그래서 직류 성분은 효과적으로 제거되고, 그러므로 변조 코드의 전송은 직류 성분을 통과시키지 않는 로터리 변환기를 이용하므로써 가능해진다. So the DC component is effectively removed, and therefore the transmission of the modulation codes becomes possible By using a rotary transformer that does not pass the direct current component. 본 발명에 따른 디지탈 변조 방법의 특정 실시예가 설명되었을지라도, 본 발명이 상기 실시예에만 제한되는 것은 아니다. Although the particular embodiments of the digital modulation method according to the present invention have been described, but the invention is not limited to the above embodiment. 본 발명 분야에 숙련된 사람이면 본 발명을 변형할 수 있을 것이지만 이러한 것도 본 발명의 범위에 속한다고 볼 수 있는 것이다. If the person skilled in the art, but also can transform the present invention is that this also be found to fall within the scope of the invention. 8비트 디지탈 데이타를 14비트 디지탈 변조 코드로 변환하는 디지탈 변조 방법에 있어서, 각각의 8비트 디지탈 데이타에 대해, (a) 2 14 14-비트 디지탈 코드중에서, 연속한 동일 비트의 수가 제1의 6비트에서는 5 또는 그 이하이고 제 2 비트에서 제13비트까지에는 2-7이고 마지막 7비트에서는 6 또는 그 이하이며, CDS의 절대값은 4 또는 그 이하인 디지탈 코드를 선택하고, 이러한 선택 절차를 반복하는 절차, (b) 절차(a)에서 선택된 14비트 디지탈 코드중에서 제1비트가 “0”이고 CDS의 값이 0인 디지탈 코드를 선택하고, 2디지탈 코드를 1그룹으로 만들기 위하여 상기 선택된 14비트 디지탈 코드와 그의 반전 코드를 쌍으로 하고, 또는 절차(a)에서 선택된 14비트 디지탈 코드중에서, 제1비트가 “1”이고 CDS의 값이 +2 또는 +4인 디지탈 코드를 선택하고, 선택된 14비트 In the 8-bit digital data to a digital modulating method for converting a 14-bit digital modulation code, for each 8-bit digital data, (a) 2 14 14- bit in the digital code, 6 of the first number of consecutive identical bits It is 2-7, and 7 is the last bit in the 6 or less, the absolute value of the CDS is selected to 4 or lower digital code, and repeating this selecting procedure, bit 5 or less, and the second bit to the 13th bit the first bit is "0" and select the digital code value of the CDS is zero, the selected 14 bits to make the 2 digital codes to the first group in the process, (b) steps (a) 14-bit digital codes selected at among the digital code and its inverted code pair, or steps (a) 14-bit digital codes selected at the first bit is selected, the digital code "1" and the value of CDS +2 or +4, and selected 14 beat 지탈 코드와 그것의 반전 코드를 결합하고, 4디지탈 코드를 1그룹으로 만들기 위하여 두개의 14비트 디지탈 코드와 상기 절차에서 선택된 한쌍의 14비트 디지탈 코드를 더 결합하고, 이러한 선택 절차를 반복하는 절차, (c) 절차(a)에서 선택된 14비트 디지탈 코드중에서, 제 1 비트는 “0”이고 CDS의 값이 +2인 디지탈 코드와, 제1비트가 “1”이고 CDS의 값이 +2 또는 +4인 또 하나의 다른 디지탈 코드를 선택하고, 4디지탈 코드를 1그룹으로 만들기 위하여 두개의 선택된 14비트 디지탈 코드와 그의 반전 코드를 결합하고, 이러한 선택 절차를 반복하는 절차, (d) 절차(a)에서 선택된 14비트 디지탈 코드중에서, 제 1 비트가 “0”이고 CDS의 값이 +4인 디지탈 코드와, 제1비트가 “1”이고 CDS의 값이 +2 인 또 하나의 디지탈 코드를 선택하고, 4개의 디지탈 코드를 1그룹 Coupling a jital code and its inverted code, and four further coupled to a pair of 14-bit digital codes selected at the two 14-bit digital codes and the procedure to make the digital code to the first group, and repeating this selecting procedure, process, (c) procedure of 14-bit digital codes selected from (a), the first bit is "0" and the value of and the digital code the value of CDS +2, the first bit is "1" and the CDS +2 or + 4 also select one of the different digital codes, and 4 to combine the two selected 14-bit digital code and its inverted code, to make a digital code to the first group, and repeating this selecting procedure, process, (d) steps (a ) of 14-bit digital codes selected at the first bit is "0", and a digital code the value of CDS is +4, the first bit is "1" and the selection of the another digital code the value of CDS +2 and the first group of four digital code 로 만들기 위하여 두개의 서택된 14비트 디지탈 코드와 그것의 반전 코드를 결합하고, 이러한 선택 절차를 반복하는 절차, (e) 상기 절차들에서 형성된 그룹들중 256그룹을 14비트 디지탈 변조 코드로서 선택하는 절차에 의해 선택된 14비트 디지탈 변조 코드를 4개까지 선택하는 단계 1과 ; Combining two of the seotaek 14-bit digital code and its inverted code to make a and procedure for repeating this selecting procedure, (e) for the 256 groups of the groups formed in the foregoing process is selected as 14-bit digital modulation code a 14-bit digital modulation code selected by the selecting process to four and one; 14비트 디지탈 변조 코드의 256그룹중에서 입력된 8비트 디지탈 데이타에 해당하는 한 그룹의 14비트 디지탈 변조 코드를 선택하는 단계 2와 ; Selecting one group of 14-bit digital modulation code corresponding to 14-bit digital modulation codes the 8-bit digital data from the input 256 of the second group and; 이미 선택된 14비트 디지탈 변조 코드와 선택될 14비트 디지탈 변조 코드의 결합부에서 연속한 동일 비트수가 2-7인 필요 조건을 만족하는 하나 또는 그 이상의 14비트 디지탈 변조 코드를 단계 2에서 선택된 그룹에서 더 선택하는 단계 3 및 ; A pre-selected 14-bit digital modulation code with one that meets the same number of bits 2-7 is a continuous requirement in the joint portion of the 14-bit digital modulation code to be selected or more 14-bit digital modulation codes in the selected group at step 2, more selecting and 3; 상기 하나의 14비트 디지탈 변조 코드가 변조 코드의 각 비트에서의 DSV(디지탈 합 값)의 절대값이 7 또는 그 이하라는 필요 조건을 만족하도록 단계 3에서 선택된 변조 코드들중에서 하나의 14비트 디지탈 변조 코드를 더 선택하는 단계 4를 포함하는 것을 특징으로 하는 디지탈 변조 방법. The single 14-bit digital modulation code DSV at each bit of the modulation code (digital sum value) the absolute value of 7 or less requirement a 14-bit digital modulation in the modulation code is selected in step 3 so as to satisfy that the digital modulation method comprising the step 4 further code is selected. 제1항에 있어서, 상기 단계 3은, 이미 선택된 선행 디지탈 변조 코드가 “10”으로 종료할때, 제1비트가 “01”, “001”, “0001”, “00001”, 및 “000001”인 디지탈 변조 코드중 임의의 하나를 선택하는 절차와 ; The method of claim 1, wherein said step 3, as the already selected the preceding digital modulation code to be shut down to "10", the first bit is "01", "001", "0001", "00001", and "000001" a procedure for selecting any one of the digital modulation codes; 이미 선택된 선행 디지탈 변조 코드가 “01”로 종료할때, 제1비트가 “10”, “110”, “1110”, “11110”, 및 “111110”인 디지탈 변조 코드중 임의의 하나를 선택하는 절차와 ; When the already selected the preceding digital modulation code to end with "01", the the first bit is "10", "110", "1110", "11110", and "111110" is selected any one of the digital modulation code and procedures; 이미 선택된 선행 디지탈 변조 코드가 “100”으로 종료할때, 제1비트가 “110”, “1110”, “11110”, “111110”, “01”, “001”, “0001”, “00001”, 및 “000001”인 디지탈 변조 코드중 임의의 하나를 선택하는 절차와 ; When the already selected the preceding digital modulation code to be shut down to "100", the first bit is "110", "1110", "11110", "111110", "01", "001", "0001", "00001" , and "000001" of the digital modulation process of selecting any one of the codes; 이미 선택된 선행 디지탈 변조 코드가 “001”로 종료될때, 제1비트가 “001”, “0001”, “00001”, “000001”, “10”, “110”, “1110”, “11110”, 및 “111110”인 디지탈 변조 코드중 임의의 하나를 선택하는 절차와 ; When the already selected the preceding digital modulation code ends with "001", the first bit is "001", "0001", "00001", "000001", "10", "110", "1110", "11110", and a procedure for selecting any one of the digital modulation code "111110" and; 이미 선택된 선행 디지탈 변조 코드가 “1000”로 종료할때, 제1비트가 “110”, “1110”, “11110”, “111110”, “01”, “001”, “0001”, 및 “00001”인 디지탈 변조 코드중 임의의 하나를 선택하는 절차와 ; When the already selected the preceding digital modulation code to be shut down to "1000", the first bit is "110", "1110", "11110", "111110", "01", "001", "0001", and "00001 the procedure for selecting any one of "the digital modulation codes; 이미 선택된 선행 디지탈 변조 코드가 “0111”로 종료될때 제1비트가 “001”, “0001”, “00001”, “000001”, “10”, “110”, “1110”, 및 “11110”인 디지탈 변조 코드중 임의의 하나를 선택하는 절차와 ; A first bit when the already selected the preceding digital modulation code ends with "0111", "001", "0001", "00001", "000001", "10", "110", "1110", and "11110" in the procedure for selecting any one of the digital modulation codes; 이미 선택된 선행 디지탈 변조 코드가 “10000”로 종료될때, 제1비트가 “110”, “1110”, “11110”, “111110”, “01”, “001”, 및“0001”인 디지탈 변조 코드중 임의의 하나를 선택하는 절차와 ; Already selected the preceding digital modulation code that when terminated with "10000", the first bit is "110", "1110", "11110", "111110", "01", "001", and "0001" of the digital modulation code of the process of selecting any one of the; 이미 선택된 선행 디지탈 변조코드가 “01111”로 종료될때, 제1비트가 “001”, “0001”, “00001”, “000001”, “10”, “110”, 및“1110”인 디지탈 변조 코드중 임의의 하나를 선택하는 절차와 ; Already selected the preceding digital modulation code that when terminated with "01111", the first bit is "001", "0001", "00001", "000001", "10", "110", and "1110" of the digital modulation code of the process of selecting any one of the; 이미 선택된 선행 디지탈 변조 코드가 “100000”로 종료될때, 제1비트가 “110”, “1110”, “11110”, “111110”, “01”, 및 “001”인 디지탈 변조 코드중 임의의 하나를 선택하는 절차와 ; When the already selected the preceding digital modulation code ends with "100000", the first bit is "110", "1110", "11110", "111110", "01", and "001" in any one of the digital modulation code selecting the process and; 이미 선택된 선행 디지탈 변조 코드가 “011111”로 종료될때, 제1비트가 “001”, “0001”, “00001”, “000001”, “10”, 및“110”인 디지탈 변조 코드중 임의의 하나를 선택하는 절차와 ; When the already selected the preceding digital modulation code ends with "011 111", the first bit is "001", "0001", "00001", "000001", "10", and "110" which is any one of the digital modulation code selecting the process and; 임 선택된 선행 디지탈 변조 코드가 “1000000”로 종료될때, 제1비트가 “110”, “1110”, “11110”, “111110”, 및 “01”인 디지탈 변조 코드중 임의의 하나를 선택하는 절차와 ; Im chosen preceding digital modulation process of the code is when the exit to the "1000000", the first bit is "110", "1110", "11110", "111110", and "01" to select any one of the digital modulation code Wow ; 이미 선택된 선행 디지탈 변조 코드가 “0111111”로 종료될때, 제1비트가 “001”, “0001”, “00001”, “000001”, 및 “10”인 디지탈 변조 코드중 임의의 하나를 선택하는 절차로 이루어진 것을 특징으로 하는 디지탈 변조 방법. When the already selected the preceding digital modulation code ends with "0111111", the process for one bit is "001", "0001", "00001", "000001", and select any one of "10" of the digital modulation code digital modulation method, characterized in that consisting of. 제1항에 있어서, 상기 단계 4는, 이미 선택된 선행 14비트 디지탈 변조 코드의 단부에 있는 DSV가 +2일때, CDS가 0, -2 및 -4인 디지탈 변조 코드중 임의의 하나를 선택하는 절차와 ; The method of claim 1, wherein the step 4, when the DSV + 2 at the end of the preceding 14-bit digital modulation code already selected, the selection procedure for CDS to any one of the digital modulation code 0, -2 and -4 Wow ; 이미 선택된 선행 14비트 디지탈 변조 코드의 단부에 있는 DSV가 0일때, CDS +2,0 및 -2인 디지탈 변조 코드중 임의의 하나를 선택하는 절차 및 ; The DSV at the end of the preceding 14-bit digital modulation code already selected zero, the procedure of selecting any one of the digital modulation code and the CDS-2 and +2,0; 이미 선택된 선행 14비트 디지탈 변조 코드의 단부에 있는 DSV가 -2일때, CDS가 +4, +2 및 0인 디지탈 변조 코드중 임의의 하나를 선택하는 절차로 이루어진 것을 특징으로 하는 디지탈 변조 방법. When DSV is -2 in the end of the preceding 14-bit digital modulation code already selected, a digital modulation method, wherein CDS is made of a procedure for selecting any one of the digital modulation code +4, +2, and 0. 제1항에 있어서, 단계 1에서 얻어진 상기 디지탈 변조 코드들은 다음의 테이블 4 및 5에 기술되어 있는 코드들이거나 또는 테이블 4의 일부를 다음의 테이블 12로 대체하므로써 얻어진 코드들이거나, 또는 테이블 5의 일부를 다음의 테이블 13으로 대체하므로써 얻어진 코드들인 것을 특징으로 하는 디지탈 변조 방법. 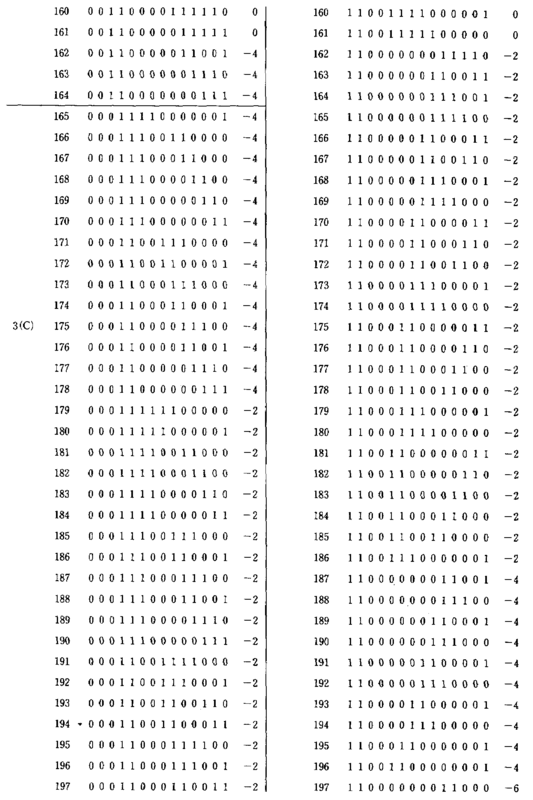 According to claim 1, wherein said digital modulation codes obtained at step 1 are the following Table 4 and are codes that described in 5 or table code obtained By replacing part of the following Table 12 in 4 to, or Table 5 digital modulation method, characterized in that the code, which are obtained by a portion replaced with the following table 13. 8비트 디지탈 데이타를 14비트 변조 코드로 변환하는 디지탈 변조 방법에 있어서, 각각의 8비트 디지탈 데이타에 대해서, (a) 2 14 14비트 디지탈 코드중에서, 연속한 동일 비트수가 제1의 7비트에서 6 또는 그 이하이고 제 2 비트에서 제13비트까지는 2-7이고 마지막 6비트에서는 5 또는 그 이하인 디지탈 코드를 선택하고, 이러한 선택 절차를 반복하는 절차, (b) 절차(a)에서 선택된 14비트 디지탈 코드중에서, 제1비트가 “0”이고, CDS의 절대값이 6 또는 그 이하인 디지탈 코드를 선택하고, 이러한 선택 절차를 반복하는 절차, (c) 절차(a)에서 선택된 14비트 디지탈 코드 중에서, 제 1비트는 “1”이고 CDS의 절대값이 4 또는 그 이하인 디지탈 코드를 선택하고, 이러한 선택 절차를 반복하는 절차, (d) 절차(b)에서 선택된 14비트 디지탈 코드중에서, CDS값이 0인 디지탈 코 In the 8-bit digital data to a digital modulating method for converting a 14-bit modulation code, for each 8-bit digital data, (a) 2 14 of 14-bit digital codes, a number of the same bits continuous 7 bits of the first 6 or less, and 2-7 in a second bit by the 13th bit and the last bit in the 5 or 6 selected the less digital code, procedure for repeating this selecting procedure, (b) a 14-bit digital process selected from (a) among these, the first bit is "0", and that the absolute value of the CDS is selected having 6 or less than the digital code, and repeating this selecting procedure, process, (c) process the 14-bit digital codes selected from (a) code, from the first bit is "1" and the absolute value of the CDS is 4 or select the less digital code, procedure, (d) steps (b) 14-bit digital codes selected at repeating this selecting procedure, CDS value is zero, a digital nose 드를 선택하고, 2디지탈 코드를 1그룹으로 만들기 위하여 선택된 14비트 디지탈 코드와 그것의 반전 코드를 쌍으로 하고, 이러한 선택 절차를 반복하는 절차, (e) 절차(b)에서 선택된 14비트 디지탈 코드중에서, CDS의 값이 +2, +4 또는 +6인 디지탈 코드를 선택하고, 절차(c)에서 선택된 14비트 디지탈 코드중에서 CDS의 값이 +2 또는 +4인 디지탈 코드를 선택하고, 4디지탈 코드를 1그룹으로 만들기 위하여 두개의 선택된 14비트 디지탈 코드와 그것의 반전 코드를 결합하고, 이러한 선택 절차를 반복하는 절차 및, (f)상기 절차에서 형성된 그룹중에서 256 그룹을 14비트 디지탈 변조 코드로서 선택하는 절차에의해 선택된 14비트 디지탈 변조 코드를 4개까지 선택하는 단계 1과 ; Selecting a de and second digital codes with a pair of the selected 14-bit digital code and its inverted code to make the first group, and the process of repeating this selecting procedure, (e) Procedures (b) a 14-bit digital codes selected at among them, the value of CDS +2, +4 or +6, select the digital code, process (c) selecting the +2 or +4 of the digital code value of CDS from the selected 14-bit digital code, and four digital as the two selected 14-bit digital codes and combine its inverted code and procedures, and repeating this selecting procedure, (f) modulating the digital 14-bit 256-group from the group formed by the process code in order to make the code as a first group a 14-bit digital modulation code selected by the selecting process step of selecting up to four 1; 14비트 디지탈 변조 코드의 256그룹중에서 입력된 8비트 디지탈 데이타에 해당하는 한 그룹의 14비트 디지탈 변조 코드를 선택하는 단계 2와 ; Selecting one group of 14-bit digital modulation code corresponding to 14-bit digital modulation codes the 8-bit digital data from the input 256 of the second group and; 이미 선택된 선행 14비트 디지탈 변조 코드와 선택일 14비트 디지탈 변조 코드와의 결합부에서 연속한 동일 비트수가 2-7이라는 필요 조건을 만족하는 하나 또는 그 이상의 14비트 디지탈 변조 코드를 단계 2에서 선택된 그룹에서 더 선택하는 단계 3 및 ; Already selected 14-bit digital modulation code preceding the selected one 14-bit digital modulation code and the continuous same bits is one or more 14-bit digital modulation codes, the selected group at step 2, which satisfies the requirement that in the coupling part 2-7 of step further selected from and 3; 변조 코드내의 각각의 비트에 대한 비트 DSV의 절대값이 8 또는 그 이하라는 필요 조건을 상기 하나의 14비트 디지탈 변조 코드가 만족하도록 단계 3에서 선택된 변조 코드중에서 하나의 14비트 디지탈 변조 코드를 더 선택하는 단계 4를 포함하는 것을 특징으로 하는 디지탈 변조방법. Further selecting one 14-bit digital modulation code in the modulation code is selected in step 3, the absolute value of 8 or hereinafter called requirement the single 14-bit digital modulation code, the bit DSV so as to satisfy for each bit in the modulation code digital modulation method characterized in that comprises the step 4 to. 제5항에 있어서, 상기 단계 3은 이미 선택된 선행 디지탈 변조 코드가 “10”으로 종료될때, 제1비트가 01”, “001”, “0001”, “00001”,“000001”및 “0000001”인 디지탈 변조 코드중 임의의 하나를 선택하는 절차와 ; The method of claim 5, wherein the step 3 is when the already selected the preceding digital modulation code ends with "10", the first bit is 01 "," 001 "," 0001 "," 00001 "," 000001 "and" 0000001 " a procedure for selecting any one of the digital modulation codes; 이미 선택된 선행 디지탈 변조 코드가 “01”로 종료될때, 제1비트가 “10”, “110”, “1110”, “11110”, “111110”, 및 “1111110”인 디지탈 변조 코드중 임의의 하나를 선택하는 절차와 ; When the already selected the preceding digital modulation code ends with "01", the first bit is "10", "110", "1110", "11110", "111110", and "1.11111 million" which is any one of the digital modulation code selecting the process and; 이미 선택된 선행 디지탈 변조 코드가 “100”으로 종료될때, 제1비트가 “110”, “1110”, “11110”, “111110”, “1111110”,“01”, “001”, “0001”, “00001”, 및 “000001”인 디지탈 변조 코드중 임의의 하나를 선택하는 절차와 ; When the already selected the preceding digital modulation code ends with "100", the first bit is "110", "1110", "11110", "111110", "1.11111 million", "01", "001", "0001", "00001", and "000001" of the digital modulation process of selecting any one of the codes; 이미 선택된 선행 디지탈 변조 코드가 “011”로 종료될때, 제1비트가 “001”, “0001”, “00001”,“000001”, “0000001”, “10”, “110”, “1110”, “11110”, 및 “111110”인 디지탈 변조 코드중 임의의 하나를 선택하는 절차와 ; When the already selected the preceding digital modulation code ends with "011", the first bit is "001", "0001", "00001", "000001", "0000001", "10", "110", "1110", "11110", and "111110" of the digital modulation process of selecting any one of the codes; 이미 선택된 선행 디지탈 변조 코드가 “1000”으로 종료될때, 제1비트 코드가 “110”, “1110”, “11110”, “111110”, “1111110”,“01”, “001”, “0001”, 및 “00001”인 디지탈 변조 코드중 임의의 하나를 선택하는 절차와 ; When the already selected the preceding digital modulation code ends with "1000", the first bit code is "110", "1110", "11110", "111110", "1.11111 million", "01", "001", "0001" , and "00001" which is a digital modulation process of selecting any one of the codes; 이미 선택된 선행 디지탈 변조 코드가 “011”로 종료될때, 제1비트가 “001”, “0001”, “00001”,“000001”, “0000001”, “10”, “110”, “1110”, 및“11110”인 디지탈 변조 코드중 임의의 하나를 선택하는 절차와 ; When the already selected the preceding digital modulation code ends with "011", the first bit is "001", "0001", "00001", "000001", "0000001", "10", "110", "1110", and a procedure for selecting any one of the digital modulation code "11110" and; 이미 선택된 선행 디지탈 변조 코드가 “10000”로 종료될때, 제1비트가 “110”, “1110”, “11110”, “111110”, “1111110”,“01”, “001”, 및“0001”인 디지탈 변조 코드중 임의의 하나를 선택하는 절차와 ; When the already selected the preceding digital modulation code ends with "10000", the first bit is "110", "1110", "11110", "111110", "1.11111 million", "01", "001", and "0001" a procedure for selecting any one of the digital modulation codes; 이미 선택된 선형 디지탈 변조 코드가 “01111”로 종료될때, 제1비트가 “001”, “0001”, “00001”,“000001”, “0000001”, “10”, “110”, 및 “1110”인 디지탈 변조 코드중 임의의 하나를 선택하는 절차와 ; When the linear digital modulation code already selected terminates with "01111", the first bit is "001", "0001", "00001", "000001", "0000001", "10", "110", and "1110" a procedure for selecting any one of the digital modulation codes; 이미 선택된 선형 디지탈 변조 코드가 “100000”로 종료될때, 제1비트가 “110”, “1110”, “11110”, “111110”, “1111110”,“01”, 및“001”인 디지탈 변조 코드중 임의의 하나를 선택하는 절차 및 ; When the linear digital modulation code already selected terminates with "100000", the first bit is "110", "1110", "11110", "111110", "1.11111 million", "01", and "001" of the digital modulation code of the process of selecting any one of and; 이미 선택된 디지탈 변조 코드가 “011111”로 종료할때, 제1비트가 “001”, “0001”, “00001”,“000001”, “0000001”, “10”, 및 “110”인 디지탈 변조 코드중 임의의 하나를 선택하는 절차로 이루어진 것을 특징으로 하는 디지탈 변조 방법. 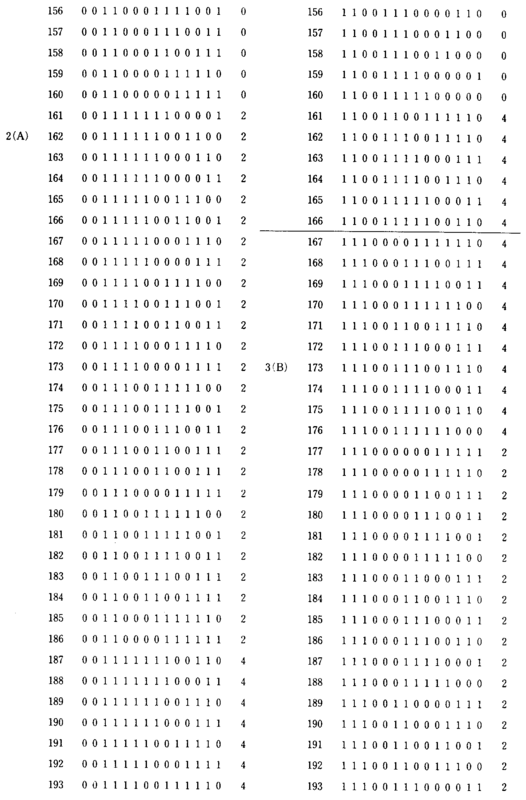 When the pre-selected digital modulation code to shut down the "011 111", the first bit is "001", "0001", "00001", "000001", "0000001", "10", and "110" of the digital modulation code of the digital modulation method, it characterized in that comprising steps of selecting any one. 제5항에 있어서, 상기 단계 4는, 이미 선택된 선행 14비트 디지탈 변조 코드의 단부에 있는 DSV가 +4 또는 +2일때 CDS가 0, -2, -4 및 -6인 디지탈 변조 코드중 임의의 하나를 선택하는 절차와 ; The method of claim 5, wherein the step 4, the DSV at the end of the preceding 14-bit digital modulation code already selected +4 or +2 when the CDS of any one of the digital modulation code 0, -2, -4 and -6 the procedure for selecting one and; 이미 선택된 선행 14비트 디지탈 변조 코드의 단부에 있는 DSV가 0일때, CDS가 +4, +2, 0, -2 및 -4인 디지탈 변조 코드중 임의의 하나를 선택하는 절차 및 ; 0 when the DSV at the end of the preceding 14-bit digital modulation code already selected, the procedure for selecting the CDS +4, +2, 0, -2, and -4 in any one of the digital modulation code, and; 이미 선택된 선행 14비트 디지탈 변조 코드에 있는 DSV가 -2 또는 -4일때, CDS가 +6, +4, +2 및 0인 디지탈 변조 코드중 임의의 하나를 선택하는 절차로 이루어진 것을 특징으로 하는 디지탈 변조 방법. When the DSV in the preceding 14-bit digital modulation code already selected -2 ​​or -4, CDS is digital, characterized in that consisting of a procedure for selecting any one of the digital modulation code, +6, +4, +2, and 0 modulation method. 제5항에 있어서, 상기 디지탈 변조 코드들은 다음의 테이블 17 및 18에 기술되어 있는 코드들인 것을 특징으로 하는 디지탈 변조 방법. The method of claim 5, wherein the digital modulation codes the digital modulation method, characterized in that the code, which are described in the following tables 17 and 18 of. DE3583819D1 (en) * 1984-05-21 1991-09-26 Matsushita Electric Ind Co Ltd A method and apparatus for generating a lauflaengenbegrenzten codes. DE3682412D1 (en) * 1985-02-25 1991-12-19 Matsushita Electric Ind Co Ltd Digital data recording and reproducing.